We are in Jordan this week. Last few days have been full of fun and very exciting days for all of us, as well as very exhausting. Today we reached Petra just couple hours ago. Here is a picture that I took from Mt. 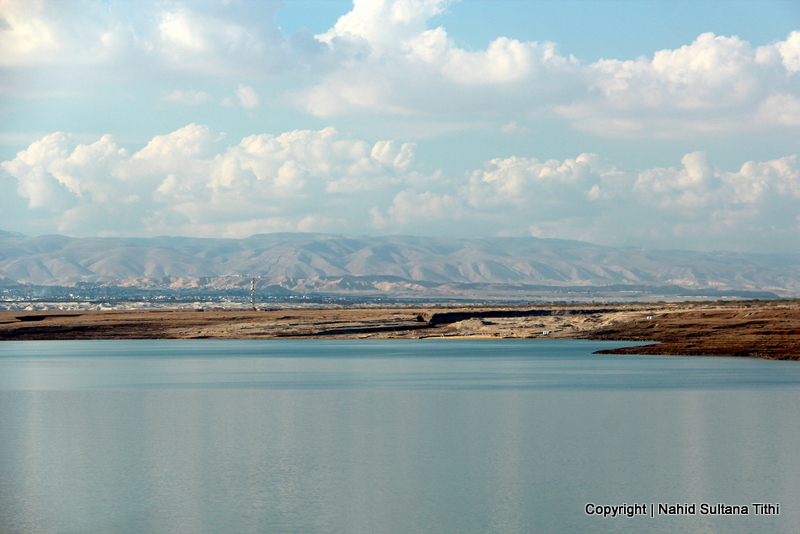 Nebo in Jordan. This is a very sacred place for Muslims, Christians, and Jews. This is the mountain where Moses (Prophet Musa AS) brought his disciples and showed them their “Promised Land” in Jerusalem. But Moses never made it to the Promise Land. Mt. Nebo is where he died and was buried. 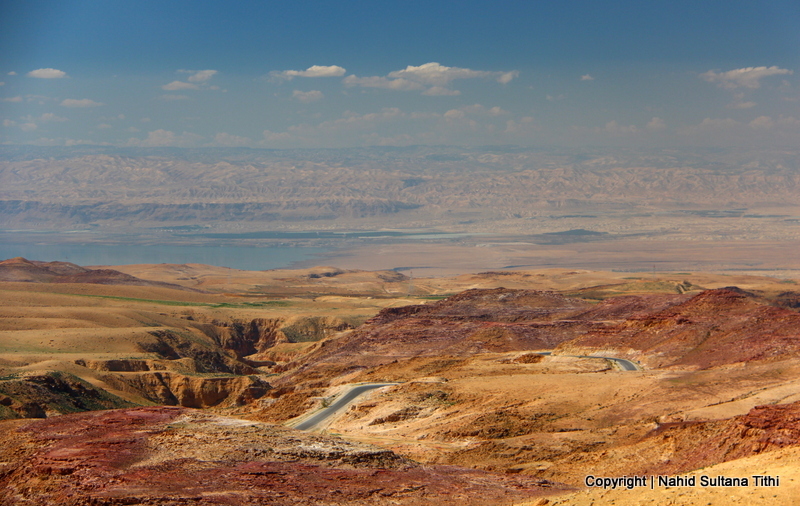 Enjoy this beautiful view of Dead Sea and Jordan River Valley from Mt. Nebo while I enjoy our stay in Jordan. 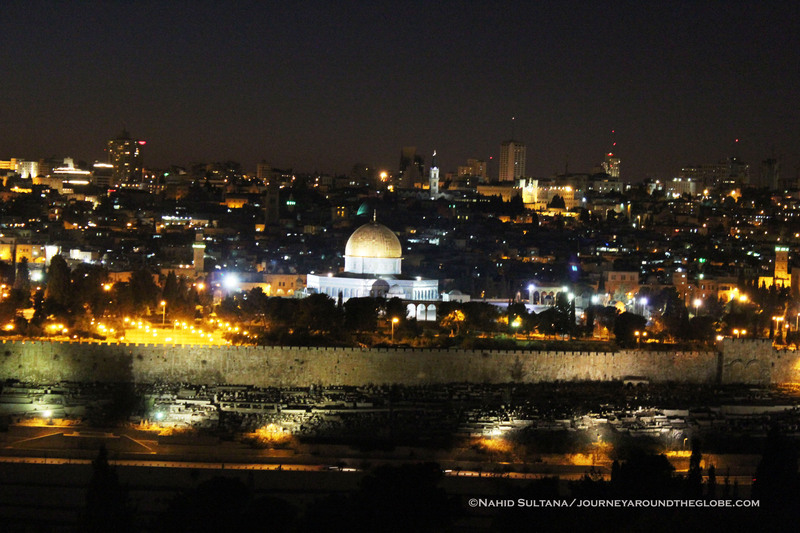 JERUSALEM, PALESTINE: Visiting Jerusalem was definitely one of my best trips that we’ve taken so far, if not THE best. I never thought of going there in my life mainly for safety purposes and also because I didn’t what to see or do there other than just going inside the Dome of the Rock, pardon my ignorance. I don’t know much about the places outside Old City of Jerusalem since we mostly stayed inside the old walls. Even then I could spend days just being within the boundaries and seeing something new every day. You won’t be able to picture the hustling-bustling life of the locals or its uniquely designed mazes of streets and small neighborhoods from outside the Old City Wall. So many historical events took place within this small boundary…religiously, politically, and emotionally. Sometimes you don’t even know or notice that you are walking by something important to some religions from many centuries ago. Every corner of Old Jerusalem has something to offer to its guests…sometimes it does get overwhelming, but that’s the beauty of this place; it can make you happy, sad, angry or just leave you feeling confused with too many facts and figures. It’s a thrill to walk on some of the ancient and original streets from the Roman time, go pass the crowded markets, looking at small chapels that commemorate different phases of Passion of Jesus, and finally getting a glimpse of shininess from the Dome of the Rock every now and then. Outside the wall we managed to explore Mt. Zion and Mt. Olives, which are within a short walking distance from Old Jerusalem. These can be very emotional places for some visitors as well as mind-boggling. Even if you are not a believer, it’s ok…if you look at it from a historical point of view, these will still touch your heart just knowing some of the important people from the past left their legacies here. I must say that Jerusalem is hard to get around if you are traveling with kids and stroller, like us. As much as it sounds amazing, it’s not easy to push or pull a stroller thru jam-packed markets or paths with 15/20 steps. Additionally, there are no ramps for strollers, wheel-chairs or cycles. Some of the streets are hilly and steep and really made my 6 years old very tired and exhausted, although she said she enjoyed every bit of it. Other than that, people are very helpful and friendly all around. You do have to pass thru some security points upon entering some of the places in the Old City. Try to respect the locals regardless of their faiths and culture and they will make your trip to Jerusalem very memorable with love and hospitality. TIME of TRAVELING: Visiting any places in Europe in January is not really enjoyable with kids and a stroller…At least for me. We went to Barcelona and Madrid during our Christmas break in 2011. After coming back from Spain, rested for couple of days, and headed out again to Jerusalem before my daughter’s school started on the 2nd week of January, 2012. It is fantastic to visit Jerusalem around this time of the year; you don’t have to deal with crazy desert weather. We did carry and use light sweaters once in a while, but the pleasant weather really helped us and the kids to make this trip more enjoyable. OUR HOTEL: We stayed in Hotel Addar in East Jerusalem and it’s about 10 minutes’ walk from Damascus Gate of Old City Wall. If you are looking for a luxurious linens and spacious room, then this is not your place. But if you want a friendly place to stay in East Jerusalem with smiling staff and great customer service…this is just fine. Other than the free breakfast and free Wi-Fi, the receptionist hooked us up with a friendly private taxi driver who gave us a day-trip to Hebron, Bethlehem, Dead Sea, and Jericho for 1200 NIS. EATING & SHOPPING in JERUSALEM: Eating in restaurants here is very cheap. You get good food with great quantity for a very reasonable price. 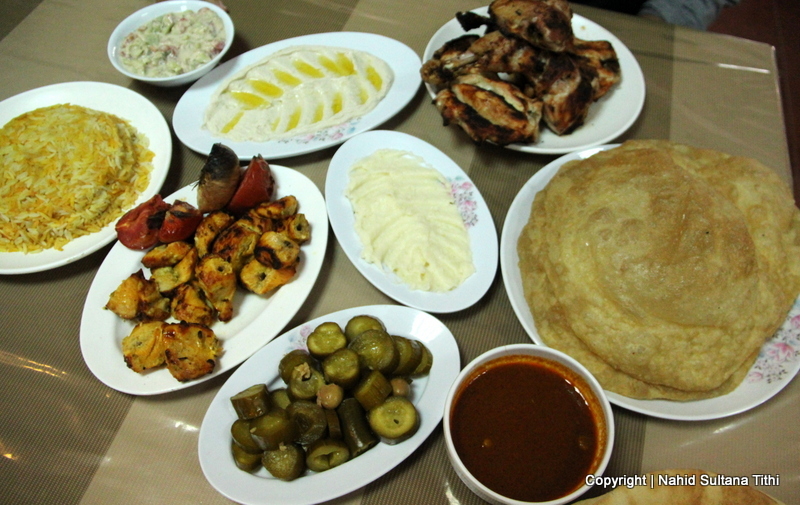 We had traditional dishes for almost all our meals, like hummus, falafel, salads, and shredded meat with pocket breads. We also tried liver with bread :0, but if you haven’t had liver before DO NOT try it. You would be blown away by their falafels, doesn’t matter which size they come in…the best I tried so far. 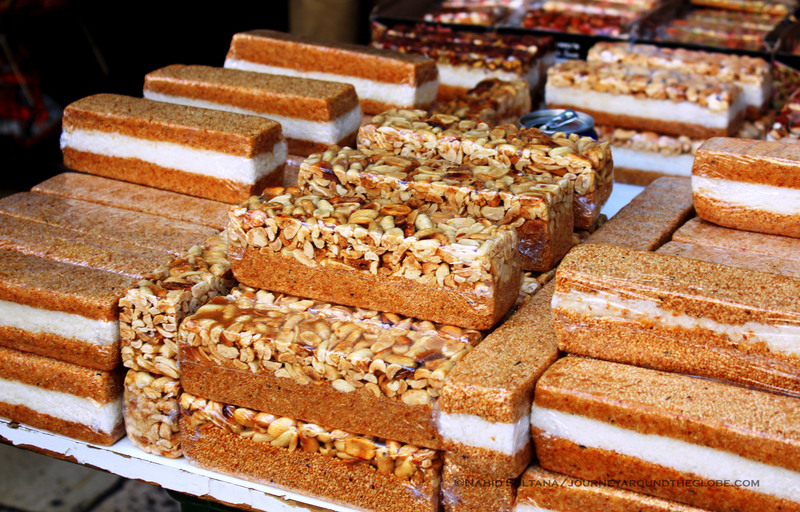 Same with baklavas…try them and you won’t forget the sweet taste of it as long as you live. Restaurants in Old City are simple yet offer tasty food. Some of them are carry-out while some have few chairs to sit down. Each quarter maintain their own ethnicity when it comes to food, meaning in Muslim quarter you will find traditional halal Arab foods, kosher dishes in Jewish Quarter, and so on. For shopping, Jerusalem has lots and lots of religious souvenirs and gifts that you can buy from almost any store in Old City. From cheap to most expensive wall-hangings, decorations, small furniture, and statues are very unique here. Spices, Arabian tea or coffee, dry fruits, and nuts are very cheap in these markets as well. 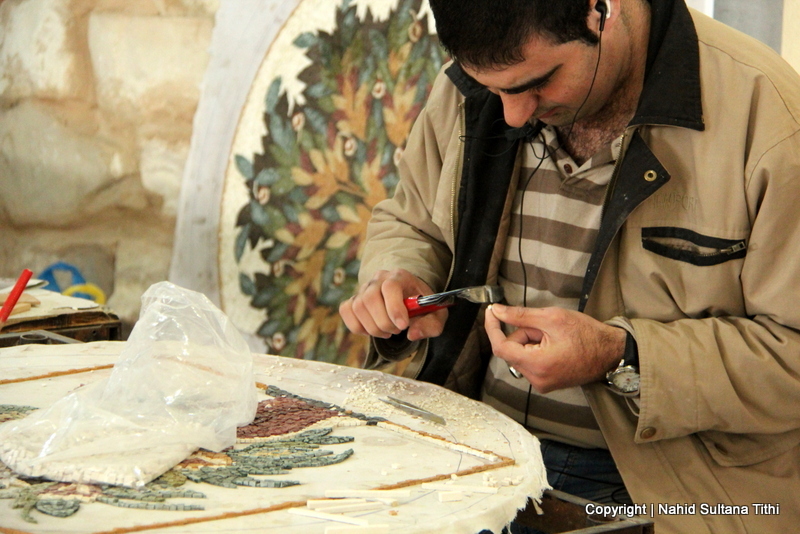 We bought a very sophisticated looking wall-décor, hand-made in Bethlehem with mother of pearl for about 400 NIS. Whatever you buy, don’t forget to bargain. Best bet is to start with half of the price that the sales-person asks and then come to a middle point. But if you find something you really like and the sales-rep is not giving you that for the price you are asking for, I think it’s a good idea to just buy it; otherwise you may not find the same item anywhere else or even the same store once you go too far from here, because every street starts to look the same after a while. Tel-Aviv International Airport or Ben Gurion Airport, is probably another best place to shop. Not only this is one of the most modern and outstanding looking airports I’ve seen so far but it is also a great place for your last minute shopping. And this is the only airport with stores open 24 hours, may be not all the stores but you will see many stores are open even if you reach the airport at 2 a.m. 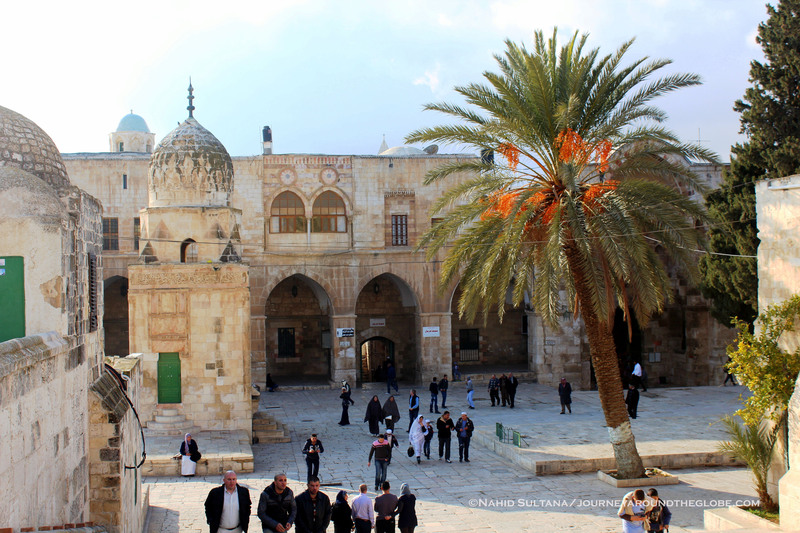 PLACES WE’VE VISITED: We spent about 4 whole days in Palestine/Israel out of which we spent 1 day to visit cities of West Bank and other 3 days were reserved solely for Old City of Jerusalem. 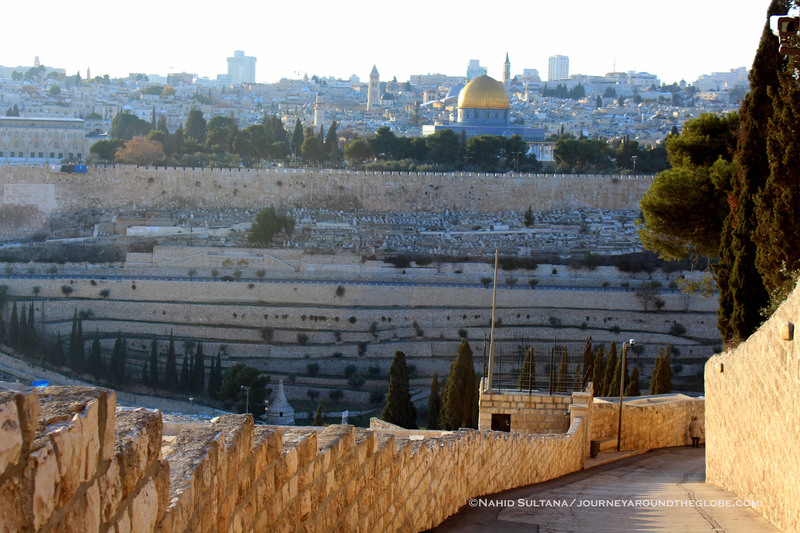 3 days in Jerusalem are nearly not enough time to explore the city. Seriously, there are hundreds of places to go and spend time in if you are into history or religion or just sight-seeing. Also, because Old City and its outer radius can be very crowded, walking can be tiresome at times, and in some of the places, you may feel emotionally so attached that you’d feel like spending little more time absorbing the atmosphere. Some of the places we didn’t/couldn’t visit but may be worth going are Western Wall Tunnel Tour, Oscar Schindler’s (who saved about 1200 Jews from the Nazi death camps) Tomb, Ramparts walk – Old City Wall is wide enough for visitors to actually take a walk along two sections of the ramp, and Jerusalem Free Tour, which is a free walking tour with a guide to go to the main sites of all four quarters. 1) OLD JERUSALEM (within the walls): There are 8 gates to enter the Old City and you can use 7 of these gates (Golden Gate is sealed off, see below) depending on which part of the city you want to access to. These gates are (in clockwise order): New Gate – the last cut gate of the wall in 1887, Damascus Gate – most monumental, Herod’s Gate – faces East Jerusalem, St. Stephen’s Gate – also known as Lion’s Gate to go to Mt. Olives, Golden Gate – believed Messiah will enter the Temple via this gate and therefore sealed off by the Muslims in 1541, Dung Gate – provides direct access to Jewish Quarter and the Western Wall, Zion Gate – gives direct access to Armenian Quarter from Mt. 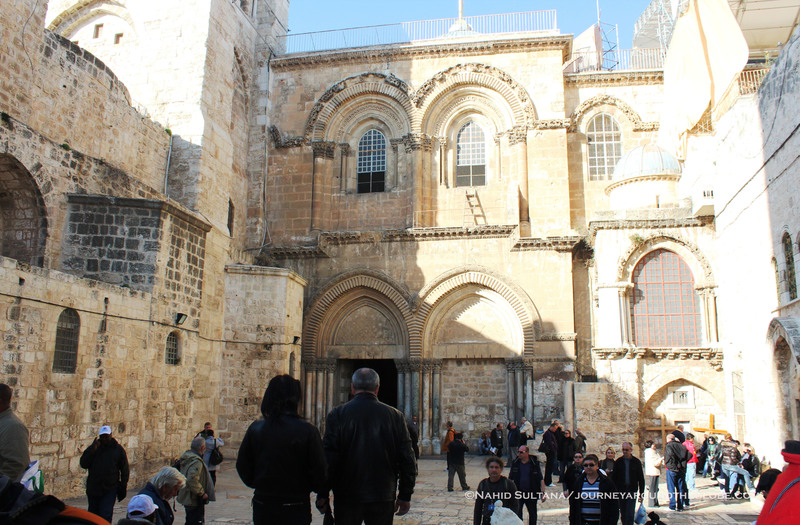 Zion and Jaffa Gate – in between Christian and Armenian quarters. There is no strict boundaries between these 4 quarters (Muslim, Jewish, Christian, and Armenian quarters) and you may not notice when you are entering a quarter, but eventually you can figure out by looking at the sign boards, type of things the stores are selling, street decorations, and the dress-up of the locals. For safety purpose, there is no rule that Muslims shouldn’t go to Jewish Quarter or vice versa, but I did read in couple places that may be people should take some pre-cautions at night when Old City becomes very quiet. But honestly, I found people within Old City wall (doesn’t matter which religion) very friendly, helpful, and nice. They see hundreds of tourists everyday and most of them don’t really judge people by their faiths or dress-ups or anything. It’s amazing to see how three religions can live their normal lives within these boundaries without any trouble or hatred within a country which otherwise is so troubled by that.…I wish it was like that all over the world. 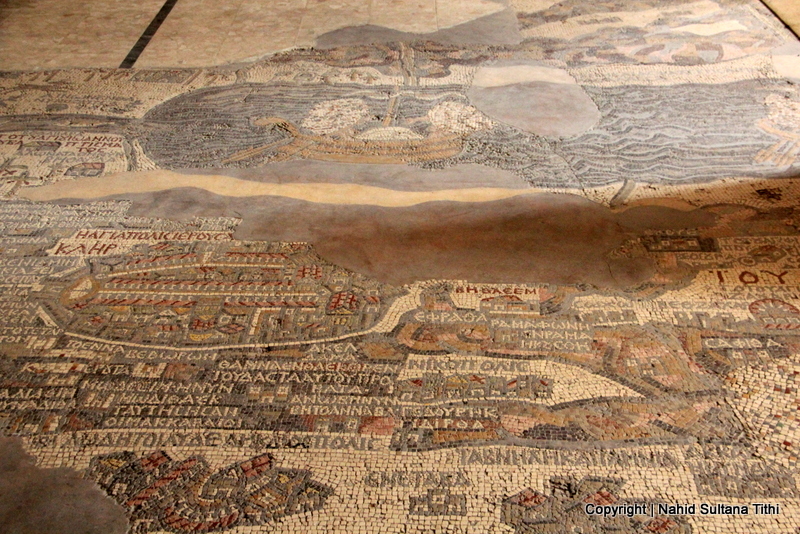 You can cover all the sites in Old Jerusalem on foot, may be it’s little bit too much for some, but it is doable. Most of the Old City is only for pedestrians due to its small width of streets and steps. You can get a map of the Old City from your hotel or any souvenir store but walking around the narrow, winding street from one quarter to another and getting lost are half the fun here. You can’t get too lost though because of its size. But it does get hard sometimes to keep track of all the small alleys and twisty paths since they all look somewhat alike. Don’t depend on your maps all the time, sometimes tiny streets are not mentioned there; better is to look around and check street names. But overall I found that old city is simply amazing and very uniquely structured. It can get a bit hard if you are traveling with kids, especially if you have a stroller…not good at all. 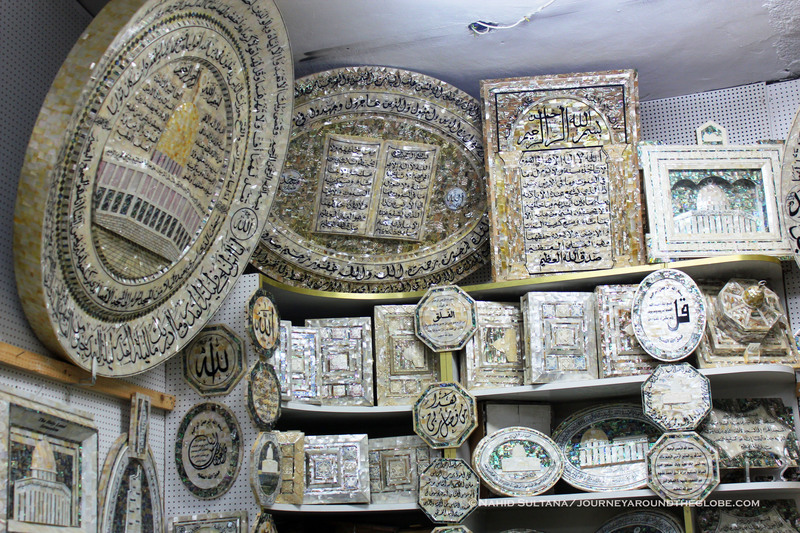 a) MUSLIM QUARTER: Muslim Quarter is the largest quarter of the Old City and the most fascinating place to explore. It is also the most crowded place of Old Jerusalem. 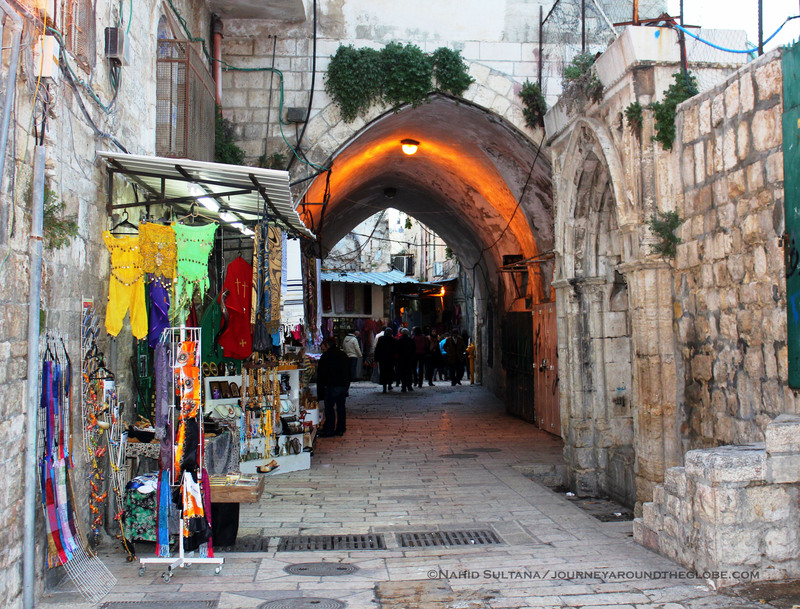 Damascus Gate, Herod’s Gate, and Lion’s Gate give easy access to the Muslim Quarter. This is an awesome place to buy Hijabs (headscarves) and abaya (ladies cloak), traditional Muslim clothes for men, decorations, wall hangings, and many other Islamic gifts items. Make sure to drink freshly squeezed orange or pomegranate juice from the street. 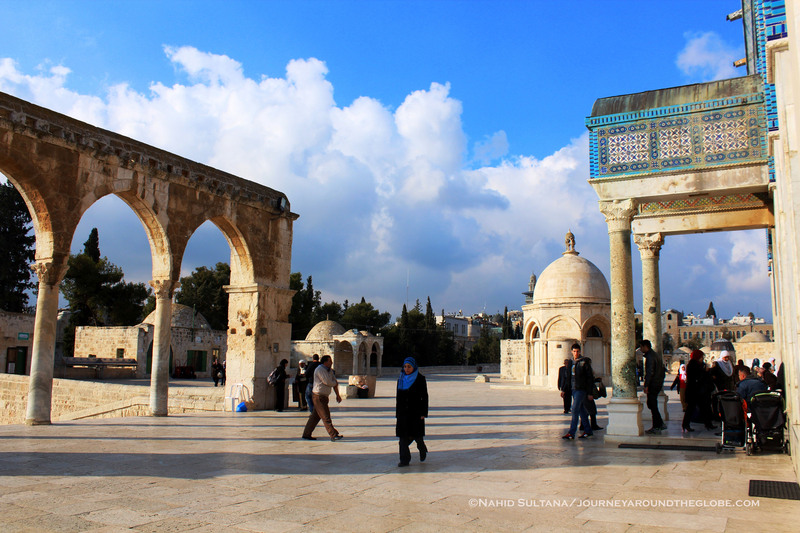 The key attraction of Muslim Quarter is the Haram-al-Sharif or the most common name, Temple Mount; it is a Noble Sanctuary for Muslims all over the world. 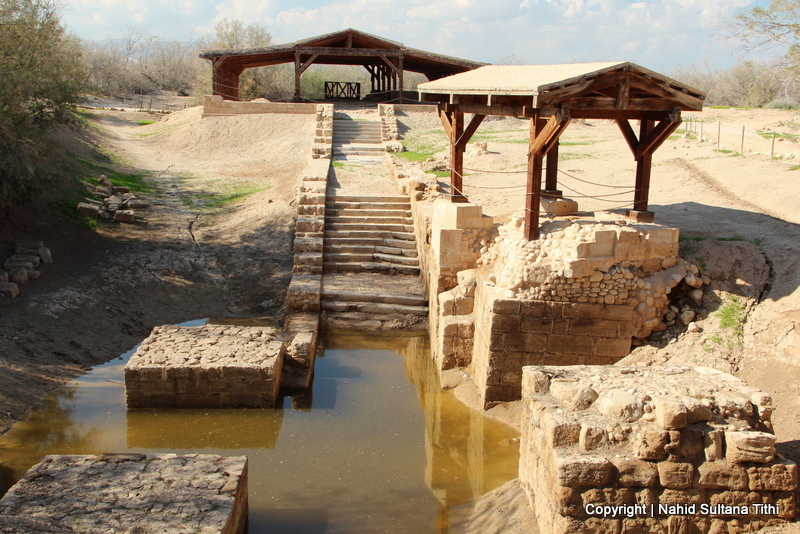 This is the traditional site of Solomon’s Temple and many other important historic events. 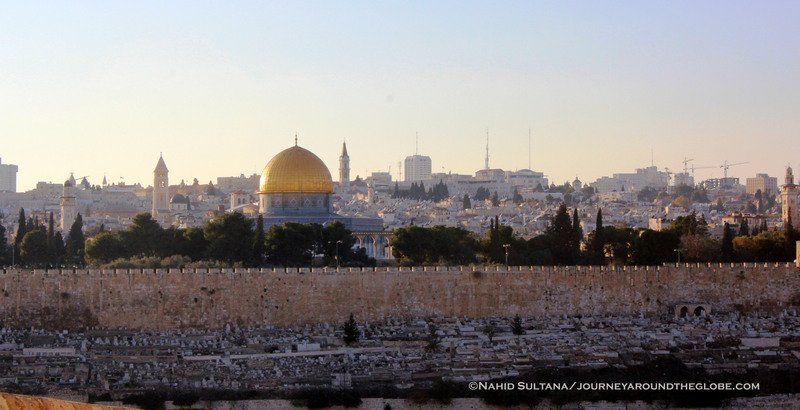 Temple Mount is a vast place which houses the Dome of the Rock and Al-Aqsa Mosque. If you keep walking towards Herod’s gate you will find a large picnic area with lots of olive trees and there is also a small house which contains the throne of King Solomon. This part of Temple Mount is very calm and quiet, nice place to look at the nearby valleys and cities from up above. Temple Mount is free to enter but it is permanently off-limit to non-Muslim visitors. 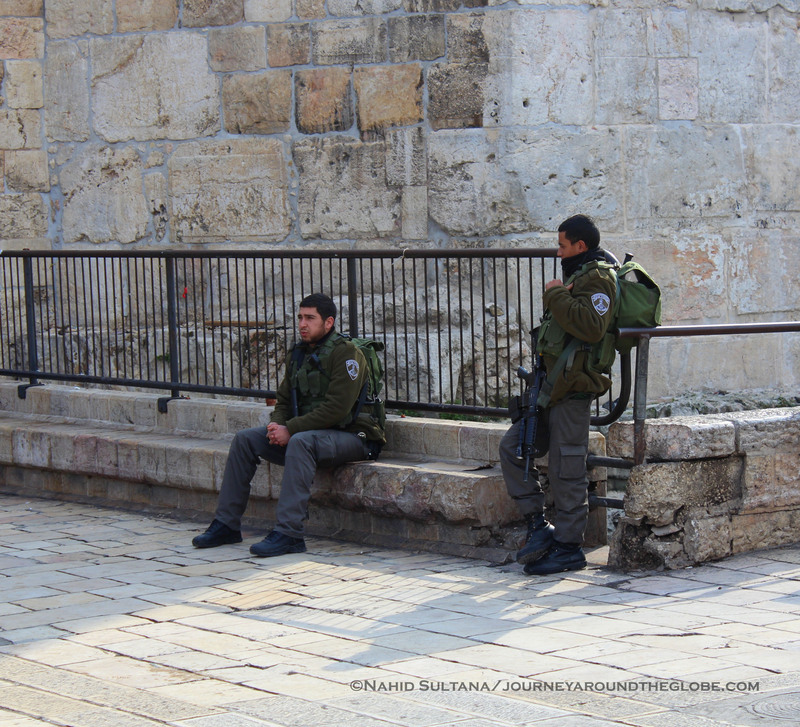 There is Israeli Police at each entrance of Temple Mount who prohibits any non-Muslims from entering the place. They not only ask questions about where you are from and what you do but they will actually make you recite some verses from the Qur’an to prove that you are a Muslim. They did that to my husband to check that if he can read few lines of Sura Fatiha (the first chapter of the Holy Qur’an). You may wonder why Israeli army guards the Dome of the Rock and the simple reason is that they don’t want any Jewish or even Christians to go there and cause trouble inside. Another reason is that a very popular Jewish belief prohibited Jews to enter Temple Mount for many years and Rabbis don’t encourage Jewish to go there anyways. 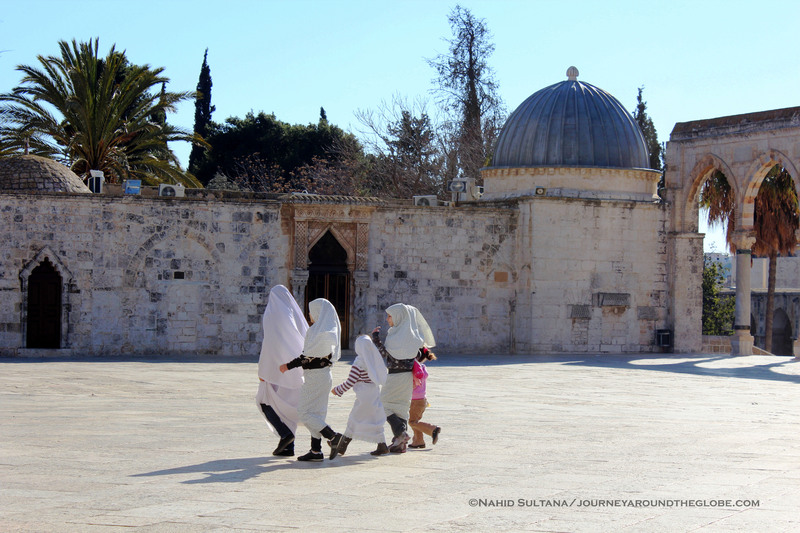 Dress very modestly when entering Temple Mount; there are some Muslim men who sit near the entrance to check if females have head-scarves and men are not in their shorts or sleeveless t-shirts. Wearing tight jeans is a big NO, NO for females; long top or loose abaya or long skirt is ideal for ladies. 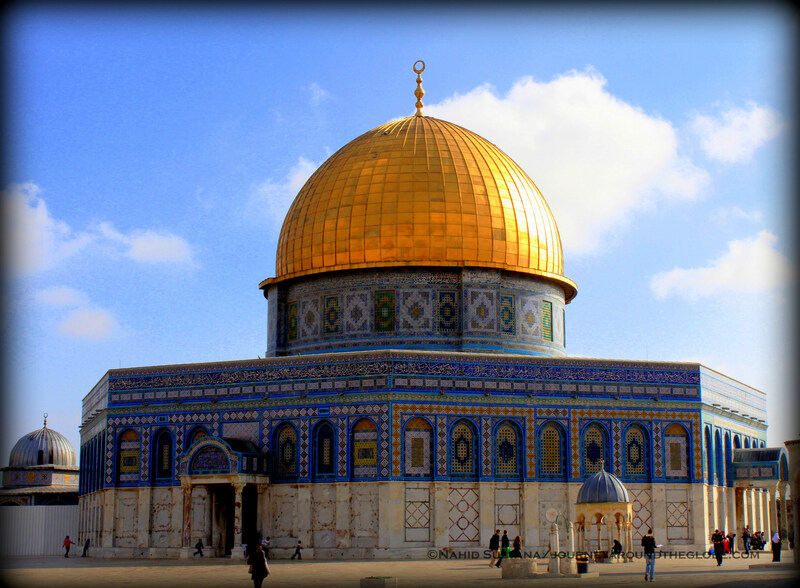 i) THE DOME of the ROCK: It is a remarkable Islamic architecture and the most prominent building of Old Jerusalem. According to Muslims, this marks the spot from where Prophet Muhamed (pbuh) ascended to heaven on the day of Mi’raj (Night Journey). The rock right underneath the dome is the site Muslims believe that Muhamed (pbuh) took off from on his Night Journey accompanied by Angel Gabriel. This is built in 691 and is the 3rd holiest site in Islam after Mekkah and Madina. Inside the Dome is absolutely gorgeous and very impressive. 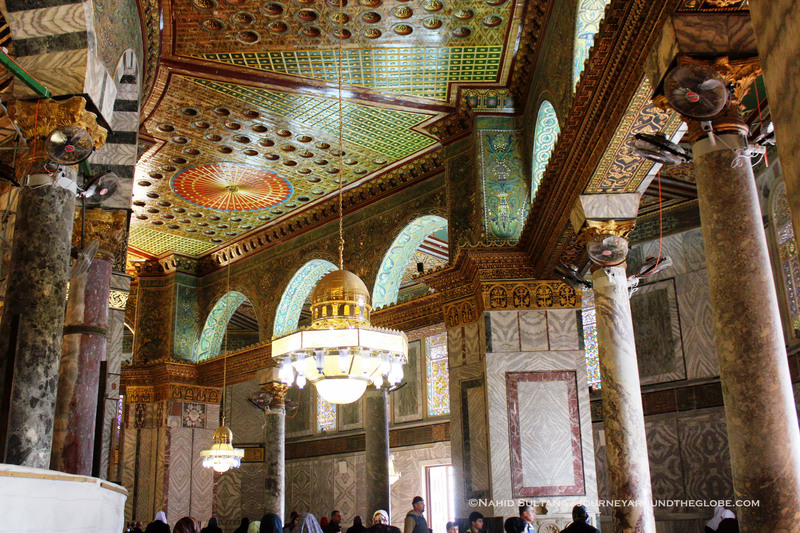 The layers of colorful mosaic, marble columns, artistic calligraphy, lavish ceramic decors, hanging-lamps, designs on the walls and ornate celling are beautiful beyond my words. There are verses from the Qur’an as well, including Sura Ya-sin and some part of Sura Maryam. Many people have a misconception that the Dome of the Rock is a mosque, but it is not. People can pray and recite Qur’an inside the dome but there is no regular congregational prayer whatsoever. This is where women gather for Jumu’ah (Friday congregational prayer). Do go downstairs in the natural cave under the rock to look around or to offer “nafl” or additional prayers. 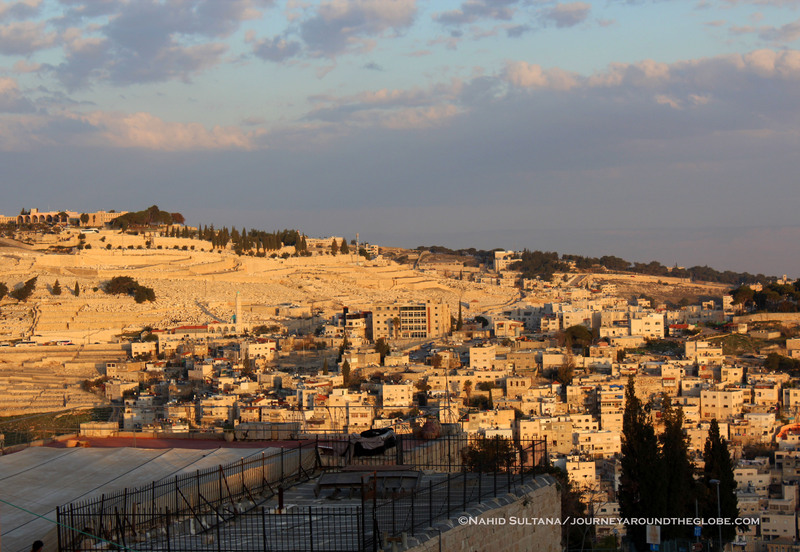 The spectacular, dazzling golden dome (with actual gold, donated by King Hussein of Jordan in 1993) is visible from far away and almost anywhere in Jerusalem. The exterior detail of the Dome of the Rock with tiles is intriguingly marvelous as well. There is no admission fee to enter the Dome of the Rock but only Muslims have access here. No visitors are allowed on Saturdays unless for prayers. Dress very modestly to enter and pray inside the Dome. 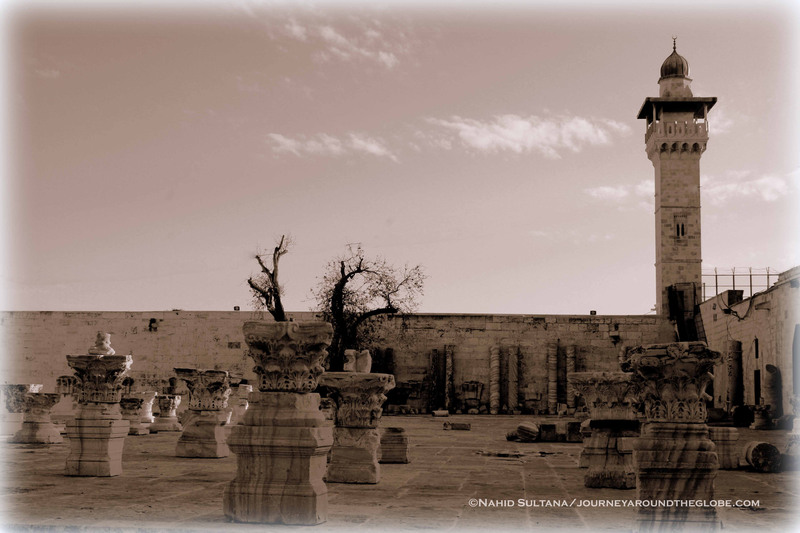 ii) AL-AQSA MOSQUE: Masjid-al-Aqsa on Temple Mount was built about 20 years after the completion of Dome of the Rock. This was once the head-quarter of the Templars when Jerusalem was captured by the Crusaders in the 11th century. According to Islamic tradition, this was the original site where Muslims used to face when praying before changing direction to Ka’ba in Mekkah. It may not be as beautiful and grand as the Dome of the Rock but the inside of Al-Aqsa is spacious and nicely decorated with traditional early Islamic designs. Unfortunately it is permanently off-limits to non-Muslim visitors as it is inside the Temple Mount. During Jumu’ah (Friday prayer for Muslims) this is where men sit for the prayer. Masjid-ul Omar is located underneath Al-Aqsa. b) JEWISH QUARTER: Jewish Quarter in Old Jerusalem looks rather “newer” than rest of the Old City. It does have few somewhat-new buildings, especially near Western Wall Plaza. 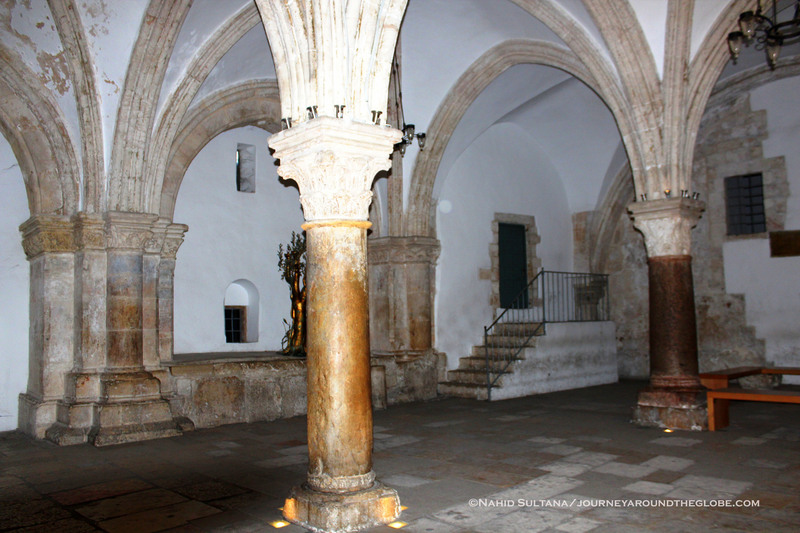 There are some old ruins/columns that you will see walking around in some part of Old Jerusalem. This is probably the best place to buy religious souvenirs and clothes for reasonable price for yourself or your Jewish friends and families. Dung Gate gives direct access to Jewish Quarter. i) THE WESTERN WALL or WAILING WALL: The Western Wall is the only fragment of the Great Temple of Solomon (Prophet Sulaiman pbuh) to survive Roman destruction and the center of Jewish yearning and memory for more than 2000 years. It is the western edge of the Temple Mount and the most sacred structure for Jewish people. You can’t see the whole 488 meters/1600 ft. long Western Wall, to visit other portion of this historic wall you can take Western Wall Tunnels Tour. To go inside the fence and near Western Wall all females have to cover their heads and men have to have kippahs (provided at the entry). No shorts or sleeveless tops are allowed there and phones should be turned off to respect worshippers. Everyone has to pass a security gate to enter the perimeter of Western Wall, just like an airport. A tunnel that we passed after the security gate, coming from Old City, is there probably from before 8th century. This paved street is from the Roman-Byzantine period (2nd – 6th century). 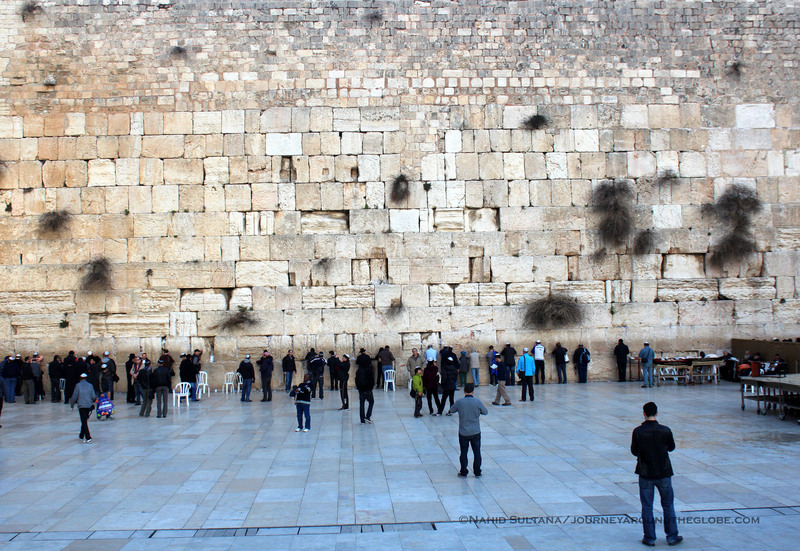 The open area in front of the part of the Western Wall is known as the Western Wall Plaza. 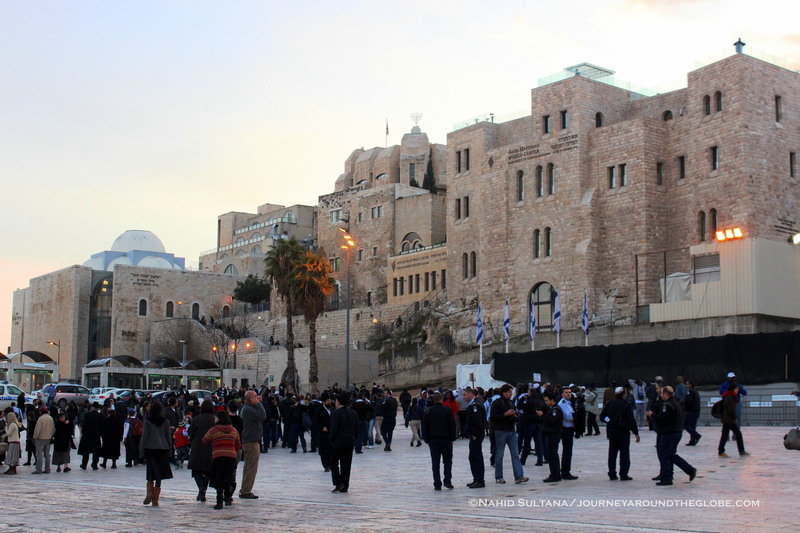 Many national events, like candle-lighting on Hanukah, Jerusalem Day ceremonies, the Priests’ Blessing, and others events, take place in this big square. There is a metal fence that separates Western Wall and its praying area from Western Wall Plaza; this is where non-Jewish visitors usually stand to visit this holy place. ii) THE CARDO: Cardo once was the main street of Jerusalem, connecting the north and south side of the Old City, from the Byzantine period in the 6th century. This is located in the heart of Jewish Quarter. There is no entrance fee. The only thing that is remaining of the old street is some original columns and a small area of paved street. Other than that Cardo is more like a covered shopping arcade at the present time. c) CHRISTIAN QUARTER: This is home of many churches and chapels which includes the most famous one “Church of the Holy Sepulcher” where Jesus was crucified, buried, and Resurrected. Please read the section below on “Via Dolorosa” for detailed information. Church of Holy Sepulcher is not just one church, rather a big collection of churches where each sect of Christianity has its own altar and chapel. 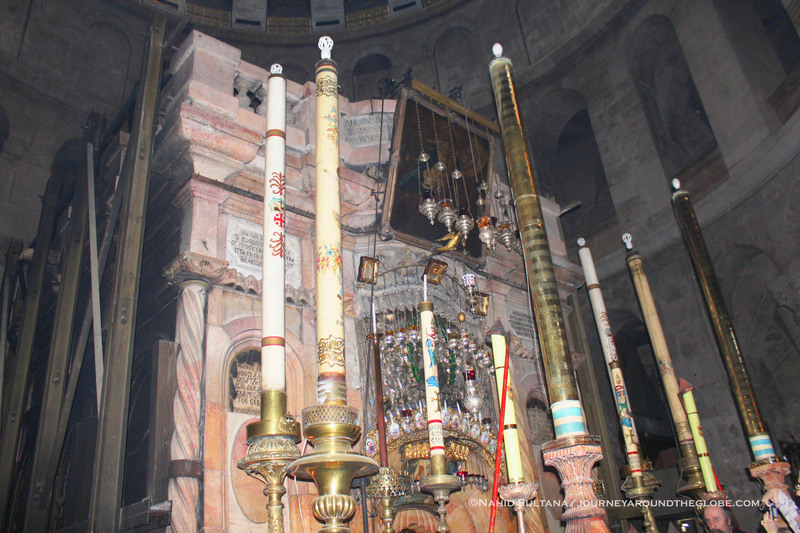 Different parts of Holy Sepulcher are controlled and maintained by different branches of the Christian Church. 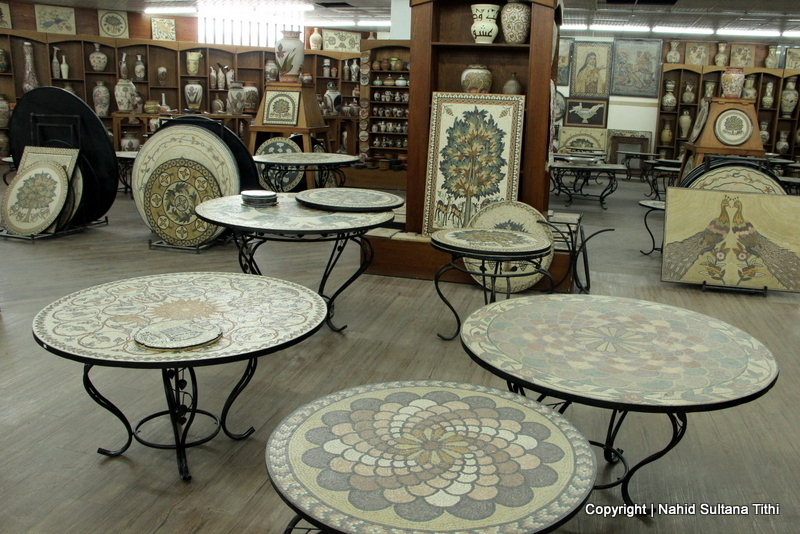 You can easily spend hours exploring old religious arts and artifacts from different sects of Christianity. There is no admission fee to enter Holy Sepulcher but there are some strict dress codes that everyone needs to follow, otherwise they will turn you back. Women cannot wear anything that shows shoulders or cleavage or dresses that are too short. Head scarves are preferable; for men no shorts or sleeveless t-shirts. Dress modestly to avoid any risk. New Gate, Jaffa Gate, and Damascus Gate are the closest to enter Christian Quarter. Church of Holy Sepulcher in the Christian Quarter, Old Jerusalem. 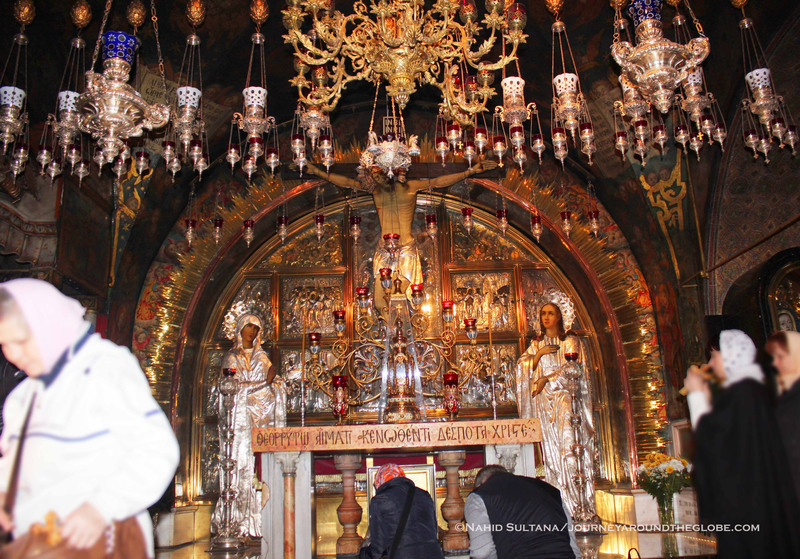 According to the popular belief, this is where Jesus was crucified, buried, and Resurrected. d) ARMENIAN QUARTER: This is the smallest quarter out of the four. Armenian Quarter is also a Christian community but with distinct feel and different look. We really didn’t go inside in any landmarks here but Tower of David and St. James Cathedral are something grand and worth visiting. This quarter can easily be accessed by Jaffa or Zion gate. e) VIA DOLOROSA: Via Dolorosa or “Way of Sorrow” is the traditional route that Jesus followed bearing his cross from Pilate’s Judgment Hall, to Calvary Hill or Golgotha, the site of crucifixion. These are winding, narrow streets of Jerusalem’s Old City that lead from the Ecce Homo Convent to the Basilica of the Holy Sepulcher. The entire route is inside the Old City Wall of Jerusalem. There is no historical basis for the route since it has changed so much over the centuries. 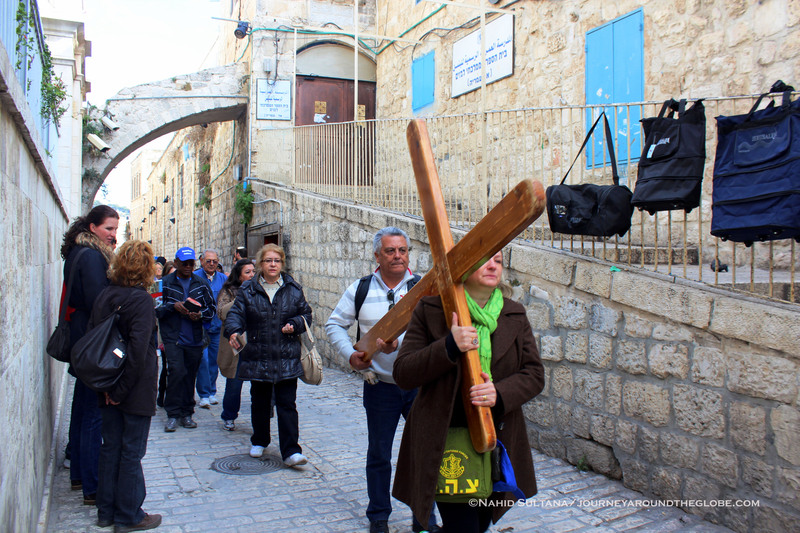 Pilgrims traditionally walk the route, identifying Jesus’ suffering. There are “Fourteen Stations of the Cross” and each station marks an event of sacred memory, with chapels for reflection, convents and monasteries of devotion, and the sacred basilica for commemoration – along Christendom’s most hallowed road. 1st station: Jesus is condemned to death. Presently it’s a college for muslim women and the left minaret “Antonia Tower” recalls the site of the Roman fortress where Jesus was condemned. 3rd station: Jesus falls under the Cross for the first time. Here now stands a Polish chapel. 4th station: Jesus meets his mother. Tradition says that Mary stood by the roadside in order to see her son. Here, in this little Armenian Catholic chapel, her grief and sadness are remembered. 5th station: Simon the Cyrenian is forced to carry the cross. 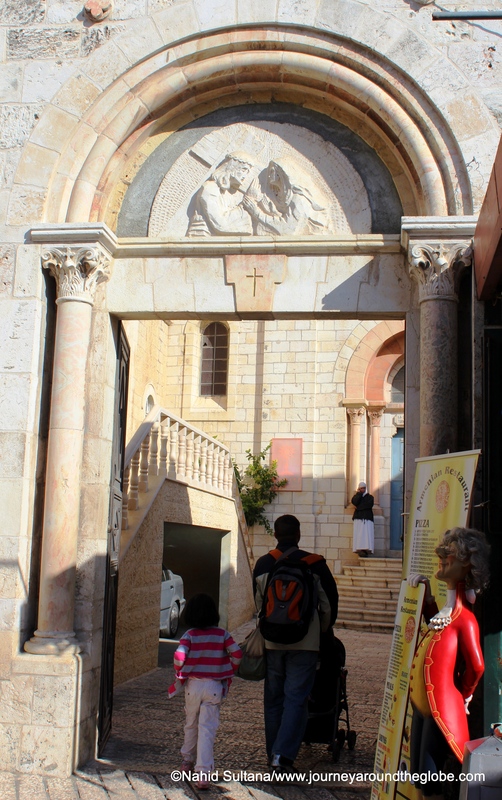 The Fifth Station of the cross is marked by a Franciscan oratory at the site where the Via Dolorosa ascends steeply to Golgotha. 6th station: Veronica wipes the sweat from Jesus’ face. This site was traditionally Veronica’s house. Currently, a chapel of the convent of the Little Sisters of Jesus can be seen here. 7th station: Jesus falls for the second time. A great Roman column, housed in a Franciscan chapel, marks Jesus’ second fall, just as he was leaving the city through a gate. 8th station: Jesus consoles the women of Jerusalem. 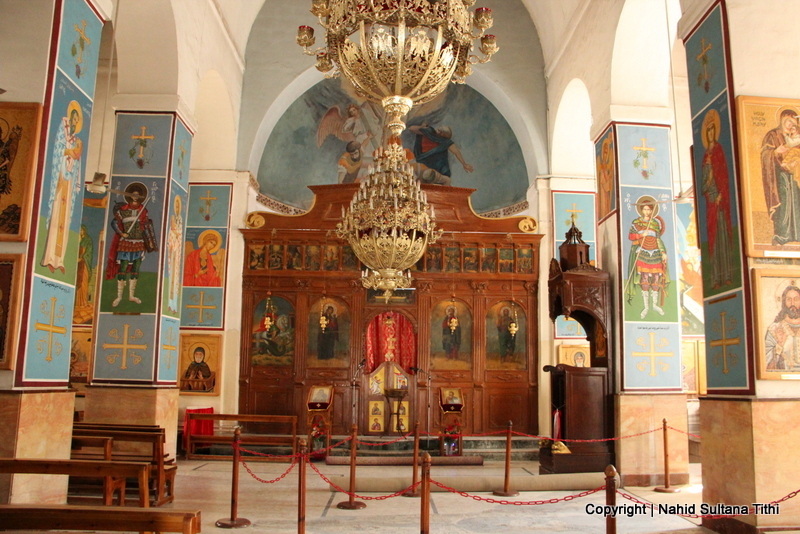 The Eighth Station is marked by a Latin cross on the wall of the Greek monastery. 9th station: Jesus falls for the 3rd time. A Roman column marks the Ninth Station. Close by are the apse and roof of the Holy Sepulcher Basilica, a reminder that Jesus collapsed within sight of the place of his crucifixion. The next five stations of the Cross are within the Basilica of Holy Sepulcher. 11th station: Jesus is nailed to the cross. 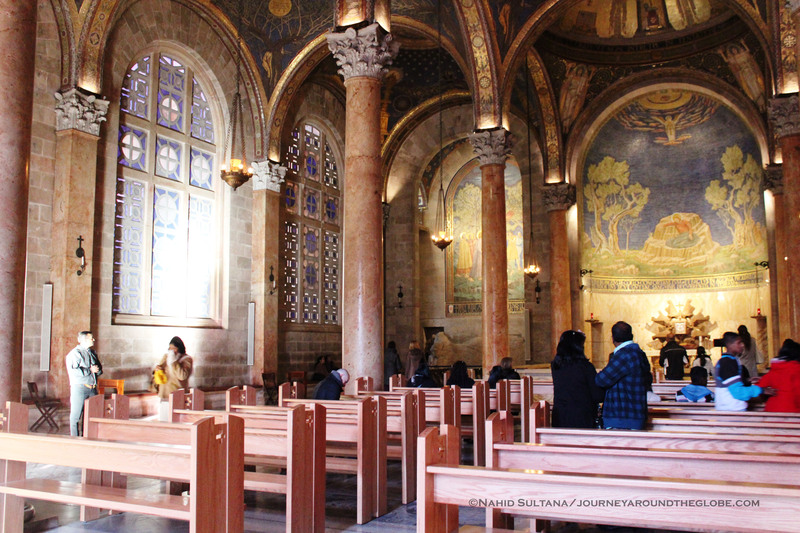 This is the main Latin shrine, wonderfully redecorated with mosaics in 1938, marks the place where Jesus was nailed to the cross within sight of his mother. 12th station: Jesus dies on the cross. This Greek altar, ornamented in Eastern style, stands over the Rock of Calvary. It is over the place where the crosses of Jesus and the two thieves were erected. In the bed-rock, beneath is a large crack caused by an earthquake on the day Jesus died. The little altar between the main ones on Calvary is adorned with a statue in wood, fashioned in the 16th Century and sent from Lisbon in 1778. It recalls the grief of Mary and symbolizes the eternal grief of mothers at the death of their children. 13th station: Jesus is taken down from the cross. 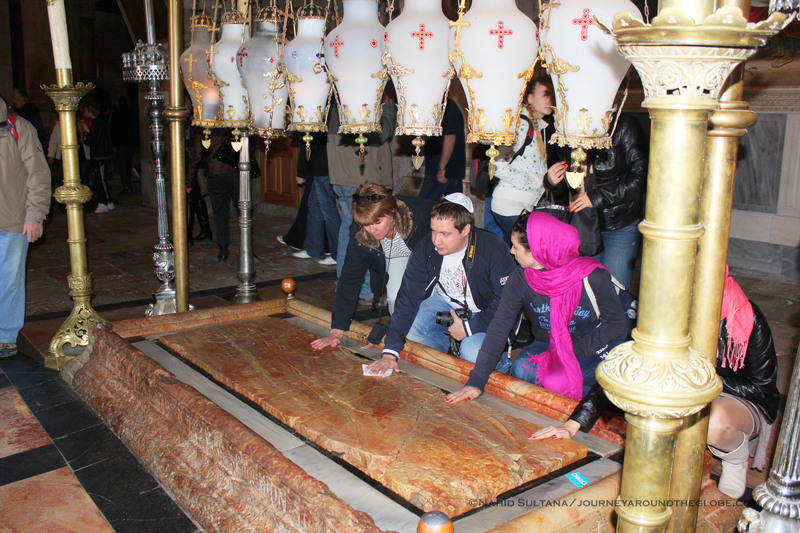 Stone of the Anointment is still there for visitor to see where Jesus was put after his death. 14th station: Jesus is laid in the tomb. This is Christendom’s most sacred place. 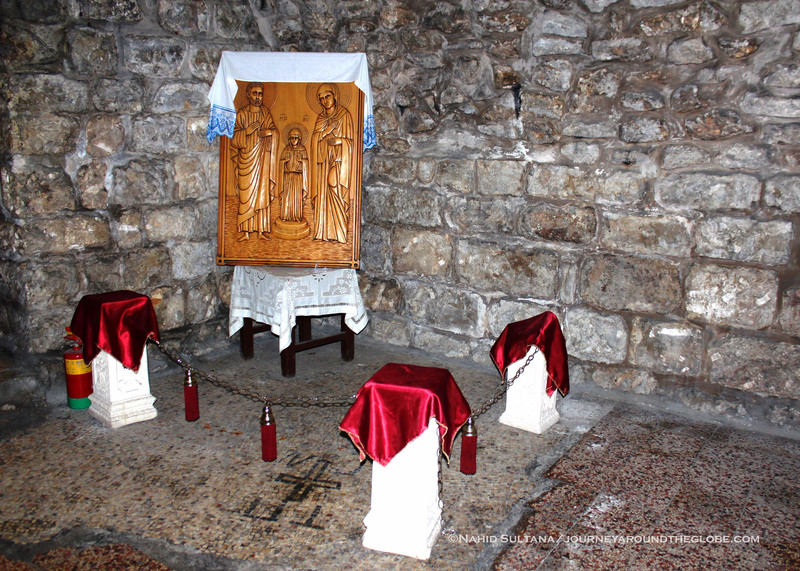 The site of Jesus’ burial and Resurrection, housed in its own chapel. This is the focal point of the entire Basilica of the Holy Sepulcher, erected by the Crusaders on Byzantine foundations, dating to the time of Constantine the Great. 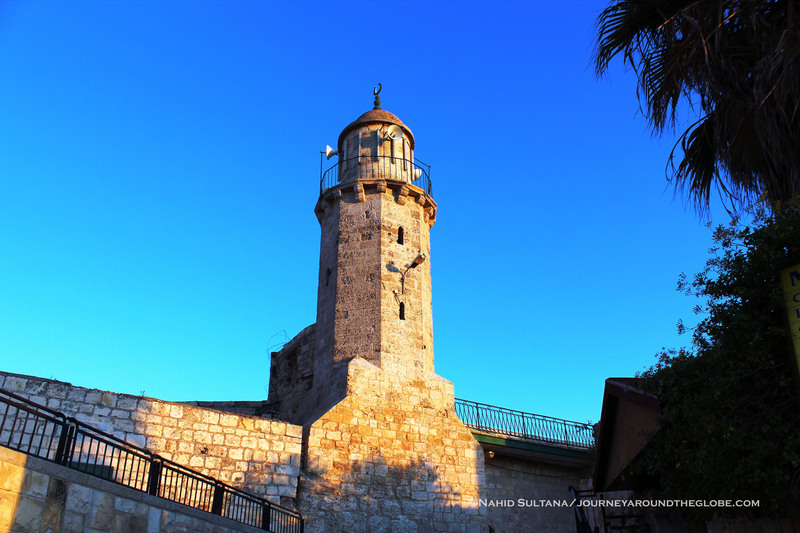 Route of Via Dolorosa is about 0.25 km/.16 miles long. You can take guided tour for this, but I personally think buying a “Via Dolorosa Guide” for 5 NIS and doing it on your own is the best way to feel the history. This route goes thru many crowded and winding small aisles, sometimes through busy markets and neighborhoods. It was a bit hard for us to push stroller through these narrow streets, some of which had stairs without any ramps. But it is definitely worth walking this route; I am not a Christian myself, but if I could I would do it again. 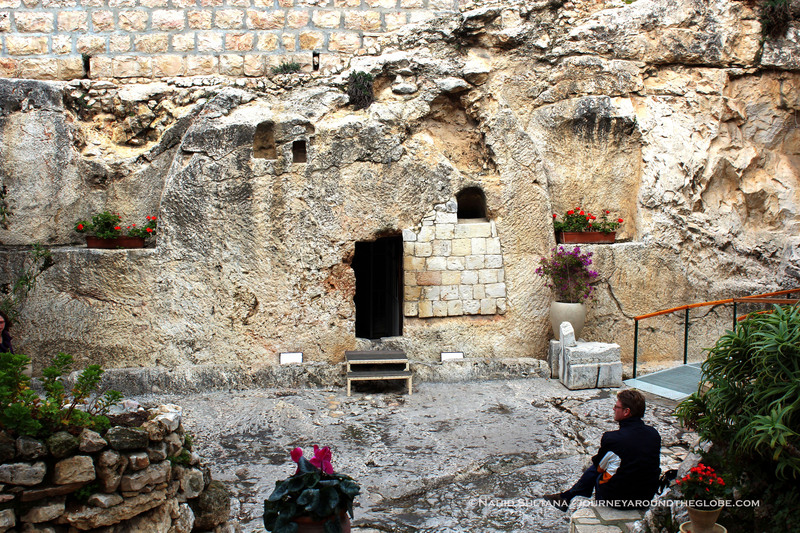 2) GARDEN TOMB: While some people believe that Jesus was crucified, died, and Resurrected at the site of Church of the Holy Sepulcher, another group of believers strongly think that Garden Tomb is the actual site where Jesus died and Resurrected. It is a small garden and takes about 30 minutes or so to look around and may be more if you want to take some time to pray. Despite of its authenticity, it is a lovely place very close to Damascus Gate of Old Jerusalem and worth visiting. 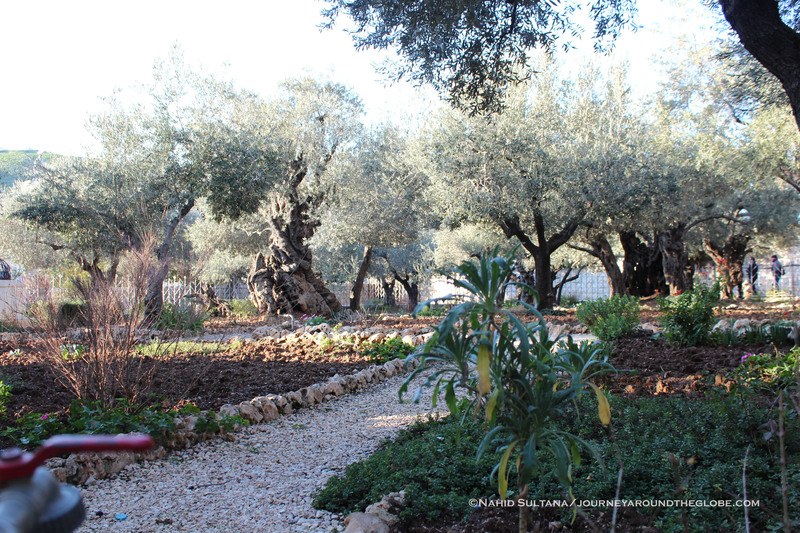 There is a bus station at one end of this garden and it is believed that Jesus was crucified somewhere there and his body was brought back to this garden which was owned by Joseph of Arimathea during that time. 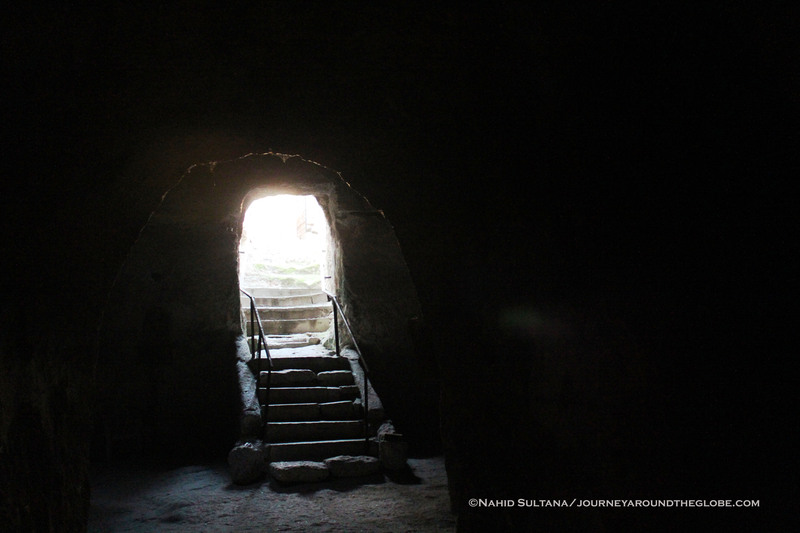 The climax of the garden, a rock-cut tomb, is said to be the burial place of Jesus and the spot of his Resurrection. An ancient winepress and an old rainwater cistern can also be seen in one section of the garden. Presently, the garden is maintained by an independent British charitable trust and they don’t charge for admission to the garden but voluntary contributions are accepted. 3) MT. ZION: Mt. Zion is within walking distance from Zion Gate which is in the Armenian Quarter. You can still see some bullet holes on the walls of the gate from a fight in 1948 between the Israelis and the Jordanians. Arabic name of this gate is Bab el-Nabi Daud (Gate of Prophet David). We used Zion Gate to visit Mt. Zion and the 3 most important sites on this small hill. Then came down, followed the Old City Wall to go back to our hotel, about 30 minutes of walk. 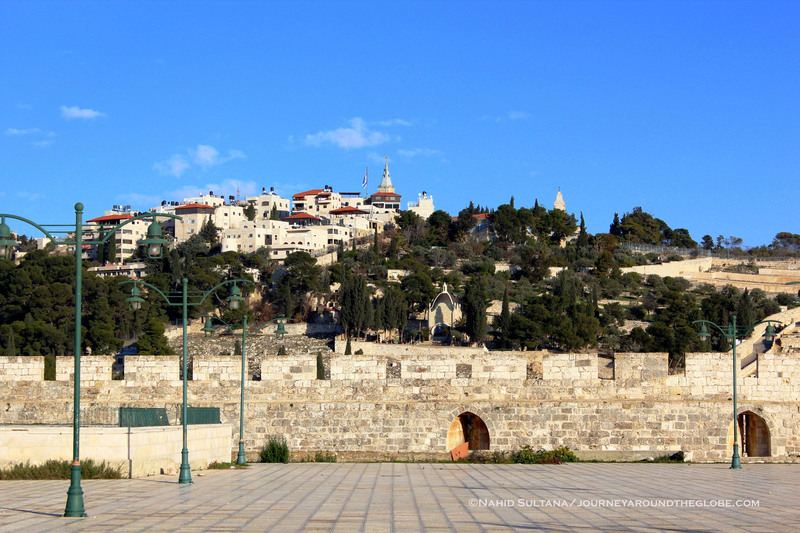 a) KING DAVID’S TOMB: After passing Church of Dormition, follow the hilly street to go a gated section. 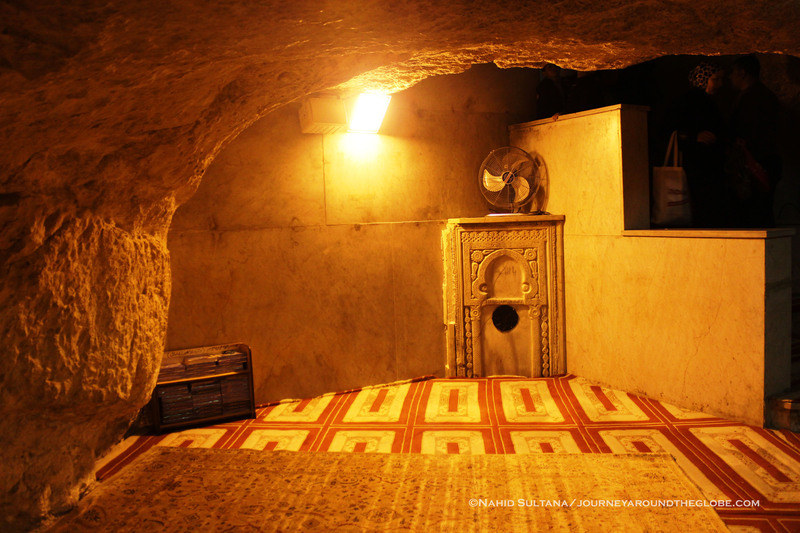 On the lower floor of a Crusader building is a small chamber housing King David’s (Prophet Daud pbuh) Tomb. There is no admission to visit the tomb, but the chamber is divided for separate viewing by men and women. The tomb is covered by a pretty drape. The women room was very small and few people can stand at a time. b) ROOM of LAST SUPPER: On the side of the same building as King David’s Tomb there are stairs to take you to the historic room of Jesus’ Last Supper. 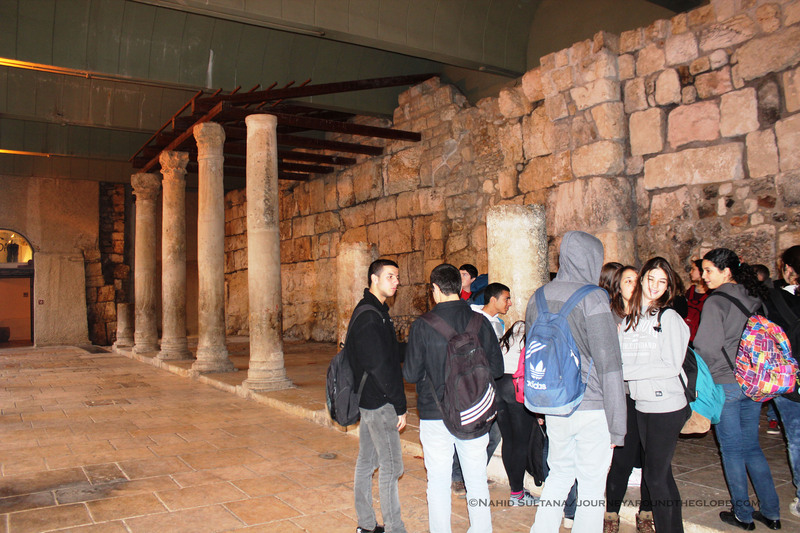 According to Christian tradition, this is the upper room in which Jesus and his disciples conducted the Passover meal – The Last Supper. There is no entrance fee to visit the chamber. The room is empty with few columns and some information boards. You can climb the stairs again to go all the way on top of the roof for a great view of the whole town and the adjacent Church of Dormition. 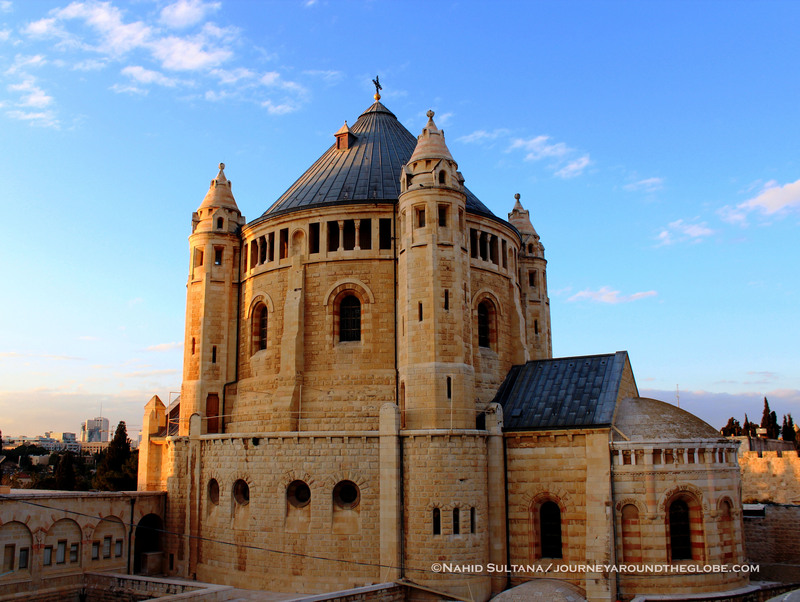 c) CHURCH of DORMITION: This beautiful church is believed to be the traditional site of Virgin Mary’s death. The church is very pretty inside and outside. 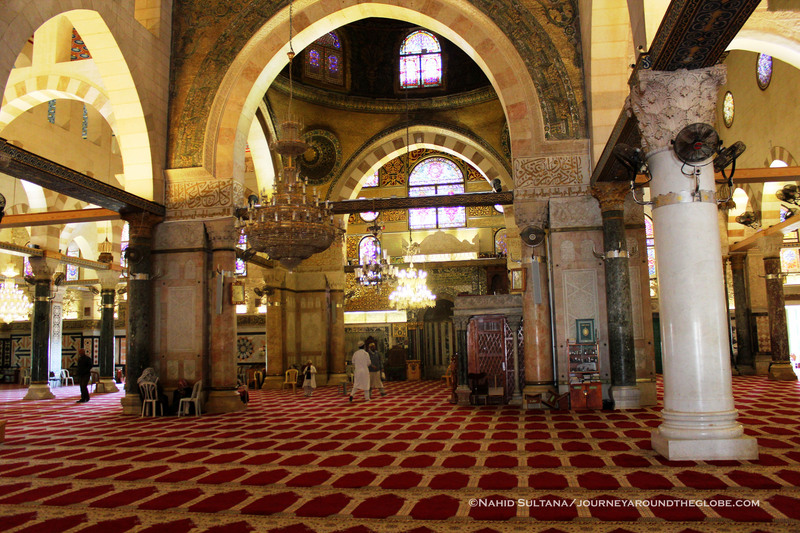 The main prayer hall, upstairs, is spacious with mosaic floor and a nice altar. The main part of the church is downstairs where a statue of Mary rests in a crypt surrounded by images of different women from the Old Testament. This is believed to be the site where Mary lived and died after Jesus’ Resurrection. Luckily, it wasn’t crowded when we visited; therefore we could enjoy the utmost serene atmosphere of this place. There is no admission fee to enter the church. 4) VIRGIN MARY’S BIRTHPLACE & TOMB: Church of St. Anne stands where traditionally it is believed to be the birthplace of Virgin Mary. This is also the birthplace of Mary’s mother, Anne and the spot where Anne and Joachim, the parents of Mary, lived. 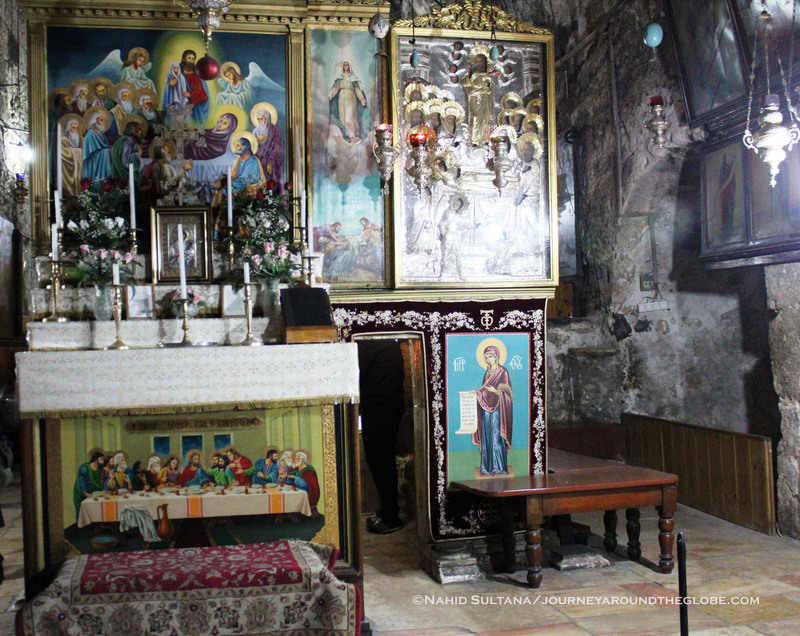 This Crusader-era church was built in 1138 to replace a Byzantine church from around 450 AD. It is located very close to Lion’s Gate, right before leaving Old City walls. There is no entrance fee but donation is appreciated. The spot where Mary was born is inside a small room and is decorated very simply. You can take the stairs to go down to see more of Jesus’ traditional maternal sites. After exiting thru Lion’s Gate and walking towards Mt. Olives, Church of the Sepulchre of Saint Mary or Tomb of the Virgin Mary can be seen at the foot of Mt. Olives. This dimly-lit church houses the sarcophagus of Mary, mother of Jesus (Prophet Isa pbuh). Inside of Tomb of Mary is decorated with lots of hanging candle-holders and many old ornaments. The building itself is very old with a 12th century façade which is one of the best preserved buildings in Jerusalem. Make sure to check your walking map for this site as we couldn’t see the name of the church anywhere outside. 5) MT. OLIVES: Mt. Olives can be accessed thru Old City’s Lion’s Gate. After crossing Virgin Mary’s birthplace (Church of St. Anne) and Tomb of Mary, cross the street to the foothill of Mt. of Olives. We visited the following places as we were climbing the hill. Oh, and don’t forget to look back for a great view of the old city and the golden dome. You can easily spend a full day just exploring all the sites on Mt. of Olives. Some of the places we didn’t/couldn’t go which may interest some visitors are: (1) Church of the Pater Noster, built over old ruins where Christ is believed to have taught Paternoster or Lord’s Prayer. Inside, it has tiled panels inscribed with the Lord’s Prayer in more than 130 languages. (2) Church of Mary Magdalene, which is a beautiful Russian Orthodox Church. You can see its golden shrine from far away. One thing to remember while climbing Mt. Olives is that it’s not very easy to climb the hill, especially with kids and strollers. You can take a taxi or ask locals if there is any alternate way to start from top of the hill and coming down. 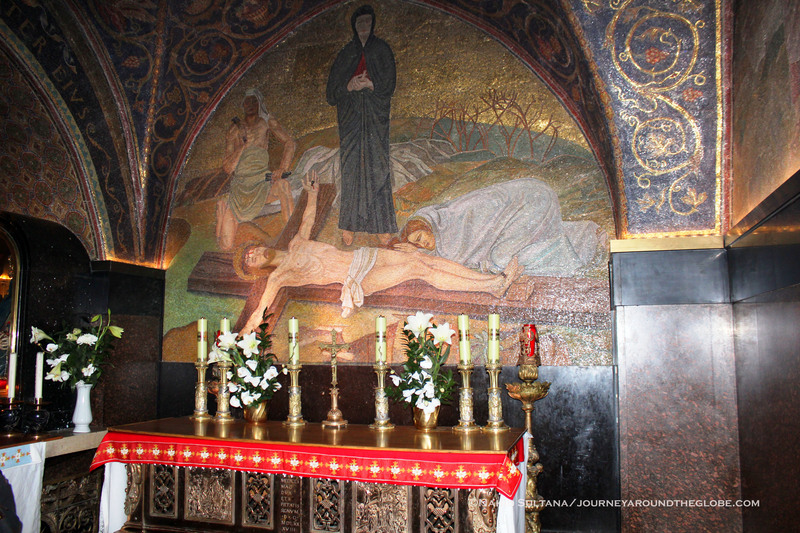 a) GETHSEMANE BASILICA of AGONY & GARDEN of GETHSEMANE: The entire area at the foot of Mt. 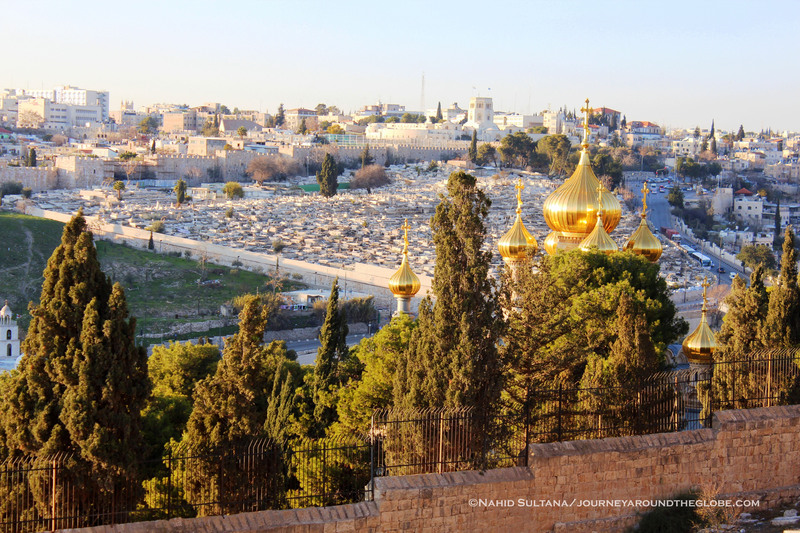 of Olives near Tomb of Mary is known as Gethsemane. Jesus often visited this grotto and this is where he was betrayed and arrested. Gethsemane Basilica of Agony is also known as the Church of All Nations, since the present look of it is the result of contributions from 12 nations. The church has 12 domes adorned with the coat of arms of each of these countries. This is the 3rd church built on this location. This is where Jesus agonized about his death and his people; later a church was built here on these rocks in the 4th century. Remember the first scene from the movie “Passion of the Christ” where Jesus was praying in a garden surrounded by hundreds of olive trees the night before he was crucified? 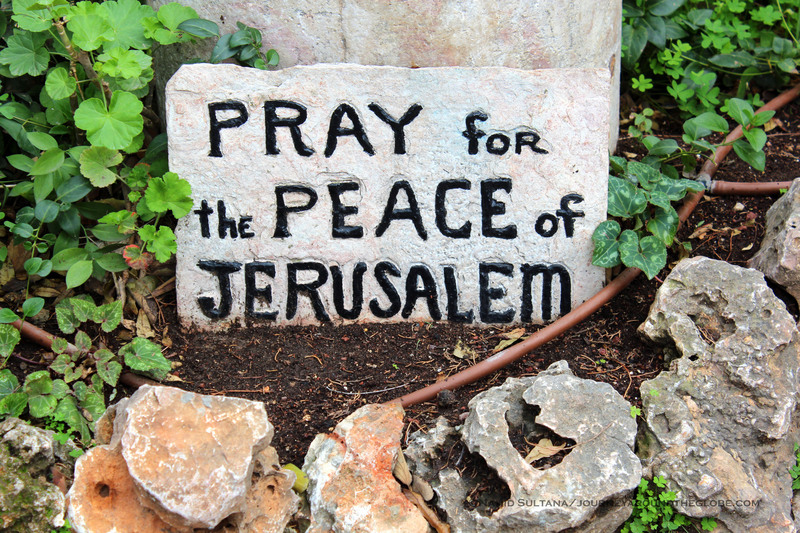 It is that historic place, Garden of Gethsemane, where the Savior prayed before the passion. That night Jesus was betrayed by one of his disciples, Judas and was arrested by the Roman soldiers. The garden is located in one side of the church right after entering thru the main entrance. This is the only surviving part of the garden that still remains from the time of Jesus. The olive trees here are more than, at least, 2000 years old, if not more. But a local was saying that they still give plenty of olives each year. b) DOMINUS FLEVIT: This is a very well-known biblical site in Jerusalem. Dominus Flevit means “The Lord Wept”; this is where Jesus wept over the fate of Jerusalem. There is a chapel which was closed at the time of our visit. But we did go inside the gated door to check out this small hilltop. View of Kidron Valley and Old City of Jerusalem is marvelous from here. 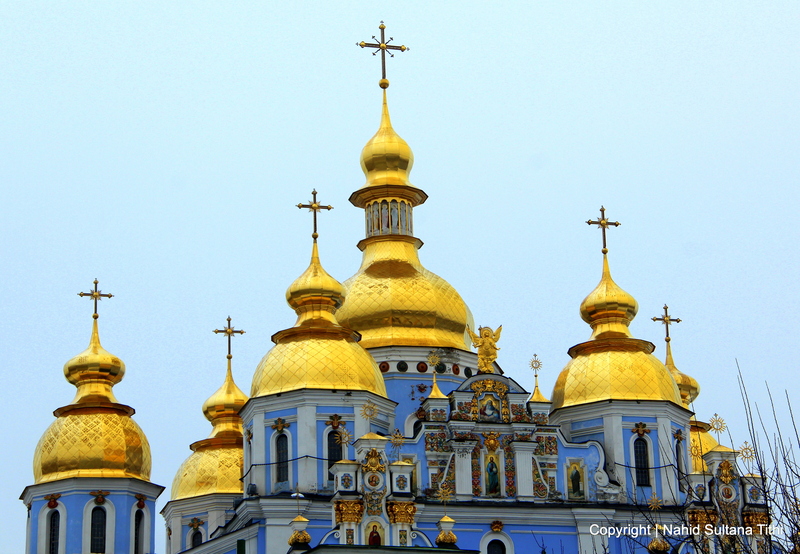 You can also see the beautiful gilded dome of a Russian Orthodox Church, Church of Mary Magdalene closely from here. There is a small collection of stone artifacts from nearby excavations and are on display in one side of Dominus Flevit. c) TOMB of PROPHETS: As we were walking up towards the top of Mt. of Olives, we saw a gated section, called Tombs of Prophets on our right-hand side after crossing an old Jewish cemetery. It was almost closing time, but the gentleman was nice enough to let us and another tourist in for a short visit. 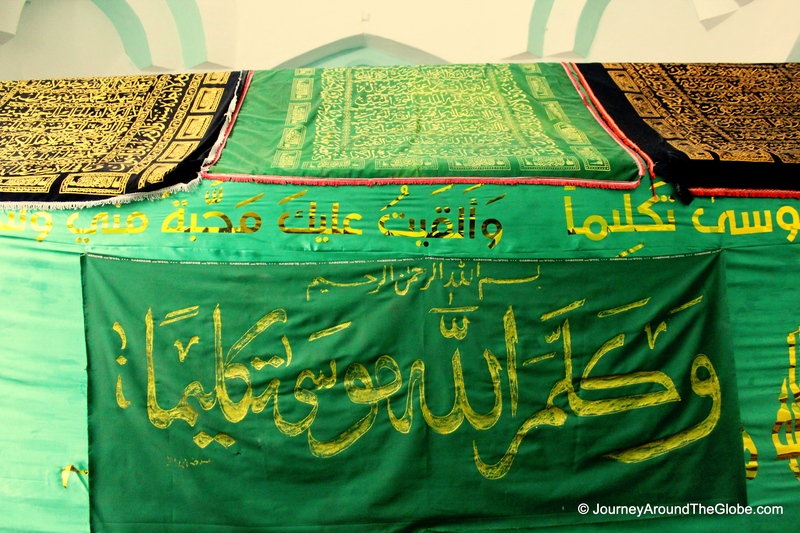 This is a hand-cut cave which houses tombs of 3 prophets of Islam, Christianity, and Judaism (Prophet Haggai pbuh, Malachi pbuh, and Zechariah pbuh) and their disciples (total 50 tombs) from the 5th century BC. The caretaker gave us some candles to walk around the cave since there is no electricity inside the cave and gave us brief history on those who are buried and where. d) MOSQUE of ASCENSION: It is located all the way on top of Mt. of Olives. It is a sacred place for both Muslims and Christians. The original medieval chapel was built around 380 AD and became part of a mosque after Saladin’s conquest in 1187. This is believed to be the site of Christ’s ascension to heaven. The mosque is usually open for daily prayers but the door of the chapel, where footprint of Jesus’ right feet is stored, was not open when we went. We tried ringing the door-bell and also calling on the phone number posted there. But the person could only open it in the morning next day during tourist hours. Please check out the pages on the right side-bar under Palestine/Israel. Click on Hebron, Bethlehem, Dead Sea, and Jericho to decide if you can spare a day to visit these unforgettable cities of West Bank. 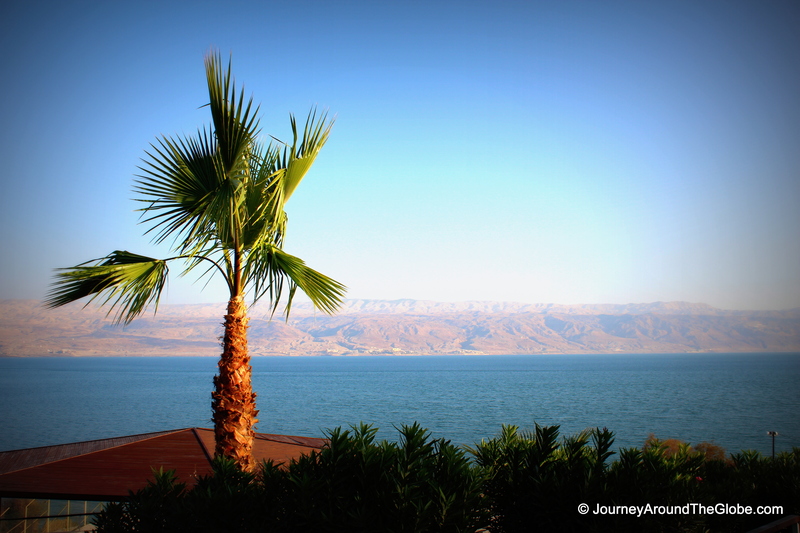 VISITING DEAD SEA & JERICHO: This is the continuation of my previous post on visiting Jerusalem. 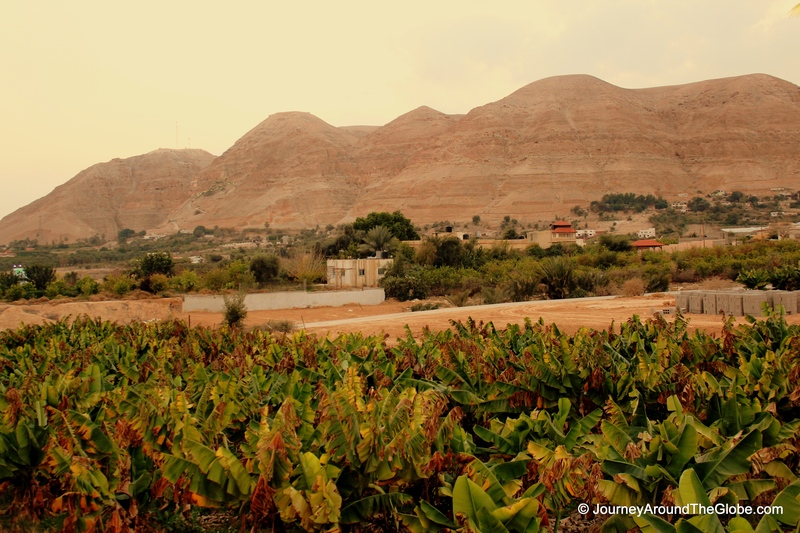 We visited Dead Sea and Jericho on the same day as Hebron and Bethlehem, which was the part of a whole package deal we got from the private taxi we hired. This day-trip cost us about 1200 NIS with a driver who spoke excellent English and gave us all the good and necessary information on every site. That was one exhausting day as I remember now, but definitely a productive one as far as enjoying all the sites that we wanted to see. TIME OF TRAVEL: We flew to Tel-Aviv on the first week of January, 2012 from Brussels. 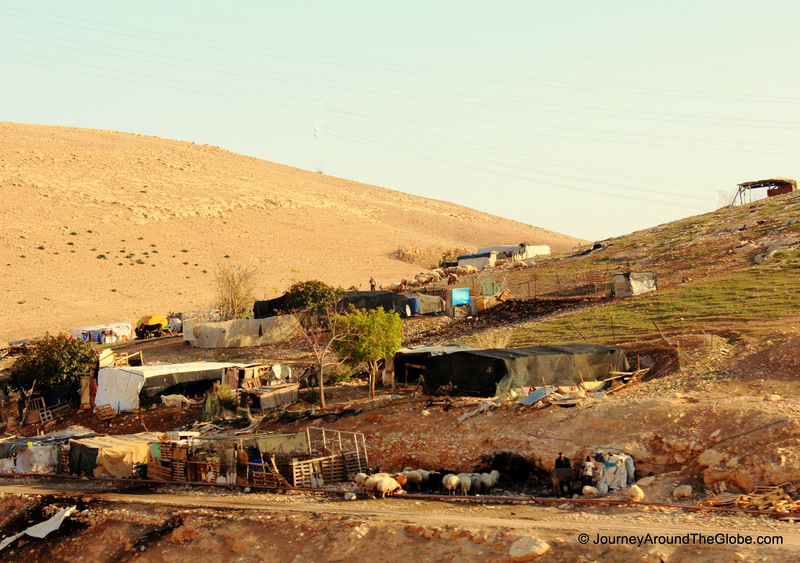 Out of the 4 days we stayed there, we took one day out to visit some cities in West Bank. Dead Sea and Jericho were a bit colder than Hebron and Bethlehem may be because we went there late afternoon or may be because they are by the water. But overall it was a sunny day to enjoy some outdoor activities. OUR HOTEL: We stayed in Hotel Addar in East Jerusalem, which is about 10 minutes of walk from the Damascus Gate or Jaffa gate of Old Jerusalem boundary and about 7/8 minutes of walk from Garden Tomb. Location was very nice and close to some local markets and shops. The hotel had free Wi-Fi and free good breakfast. It wasn’t all that luxurious and spacious hotel but the customer service was great. It is far from Tel-Aviv Int’l Airport (if I can remember correctly it took us about little more than 45 minutes) but our hotel arranged a taxi pick-up from the airport for a reasonable price. EATING & SHOPPING: We had our lunch in a local street-side restaurant in Bethlehem before leaving the city. Different kinds of salad, hummus, shredded meat, pocket breads, and falafel are something you will see in almost every traditional Palestinian restaurant. I have tried falafel before in many places but nothing comes even close to the ones in Palestine. When you are in any beach of Dead Sea, don’t forget to pick up some Dead Sea cosmetics, like black mud, bath salt, cream, lotion, musk, face wash, and other good stuff. They are not very expensive and sometimes you get good deals like if you buy two items you get one for free. 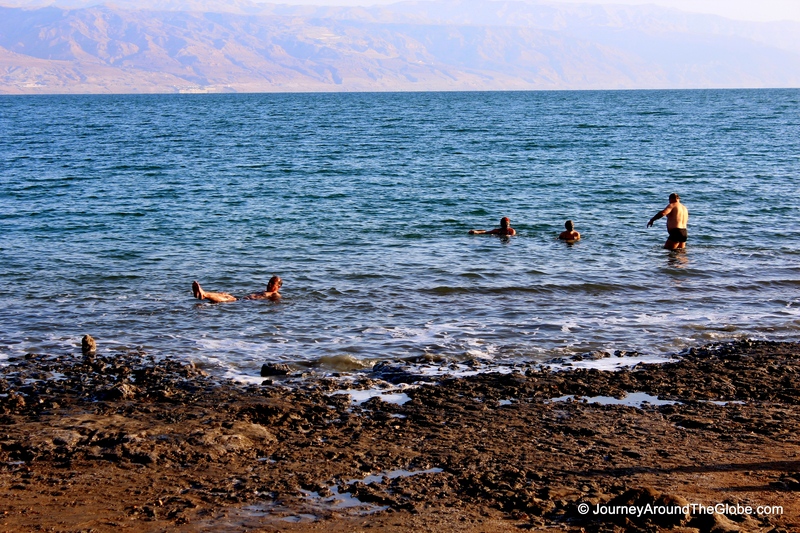 PLACES WE’VE VISITED: After leaving Bethlehem, our next destination was Dead Sea – Kalia Beach. The drive on Highway-1 was absolutely bold and beautiful. The sun wasn’t too strong in the late afternoon, which filled the mountains and desert with warm glow. 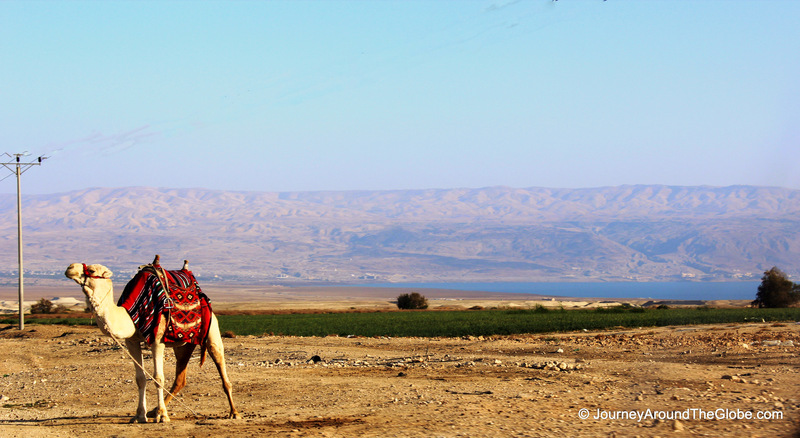 While on Highway-1, it was unique to see few Bedouin settlements on rugged mountains near Dead Sea, camels decorated in gorgeous cloaks, and marvelous long stretch of painted desert on both sides of the road. 1) DEAD SEA (KALIA BEACH): We reached Kalia Beach around 3-3:30 pm. It was a fantastic spot to enjoy Dead Sea. You have to pay 47 NIS entrance fee if you want to go swimming (rather floating) in the water. Our taxi driver spoke to the ticketing guy and told that we were there just to take some pictures and spend few minutes near water; so we just got in for free. We weren’t prepared to go swimming. So, we stayed mostly on the beach taking some pictures, putting some Dead Sea mud on our hands and legs, looking at Jordan on the other side, and watching others float on their backs in the lake. This is truly a beautiful oasis in the middle of the desert and a must-see place in Israel/Palestine. Talking about lake, yes, Dead Sea is not actually a sea; it is the deepest landlocked salty lake in the world. Interestingly, it is also the lowest point on earth at 423 meters below sea level. It is called Dead Sea because no sea creature can survive in this water, except some single cell bacteria. For safety purposes, don’t try to swim in the water…people actually die every year when they try to go for regular swimming in Dead Sea. For the high concentration of salt here, you can literally float on your back without sinking. 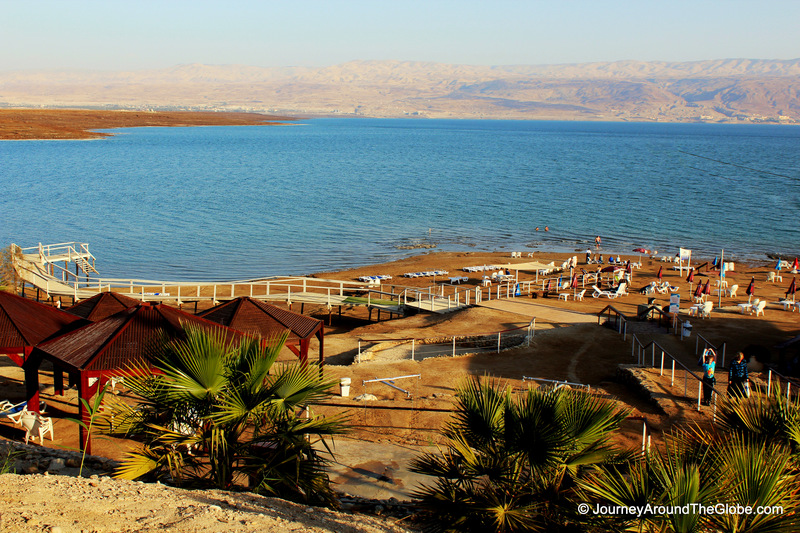 Another fun fact is that, Dead Sea is also known as Nature’s spa. The minerals of this water can treat diseases like psoriasis and osteoarthritis. The mud is also used as natural musk. It feels very slippery when you touch the water, it leaves whole bunch of salts and minerals on your hands or body after drying…pretty cool. We saw people covered with mud all over their body on the beach…well, sure, why not use nature’s free musk when in vacation? 2) JERICHO: Located in West Bank, Jericho is supposedly the OLDEST inhabited town in the world and the most excavated site in Palestine after Jerusalem. This is really a beautiful rich oasis (258 meters/846 ft. below sea level) of greenery in a desert landscape near Dead Sea in Jordan Valley. We couldn’t visit another historical place of Jericho, Hisham’s Palace, properly since it was way too dark by then. But we did stop and managed to take some pictures of the old ruins of the palace. Another famous site here which we didn’t go is Tell-es-Sultana where you can see ruins that date back to 9000 BC. This is where the earliest settlement was located and is just a couple of km from the current city. 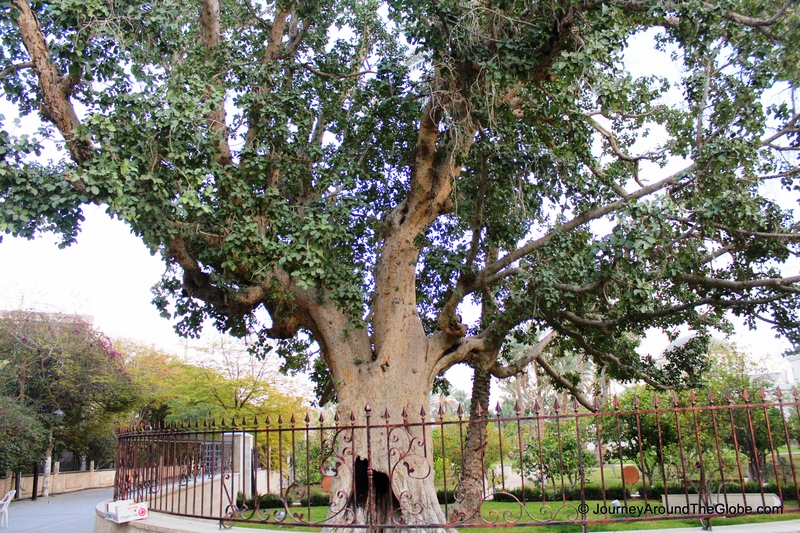 a) FAMOUS SYCAMORE FIG TREE of JERICHO: This is a 2000 year old fig tree which has been standing there since the time of Jesus (pbuh). 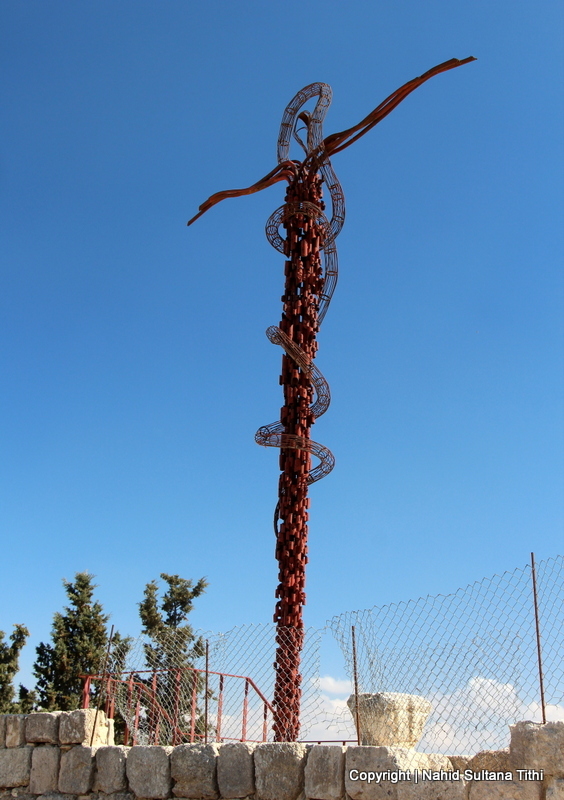 The story goes that a corrupted tax-collector name Zakariyah, who was a very short man, climbed this tree to see Jesus when he was coming to Jericho from Egypt on his way to Jerusalem. Thanks to our driver who told us about the history, otherwise one can just pass-by this tree without knowing the history behind it. Coincidentally, this biblical story was told at my daughter’s school just before the Christmas break which she could recollect and confirm the driver’s version. It was my 6 years-old who remembered that the tax-collector’s name was Zakariyah.One way to recognize it is that the tree is surrounded by a metal fence, but I didn’t see any board or anything with any information. 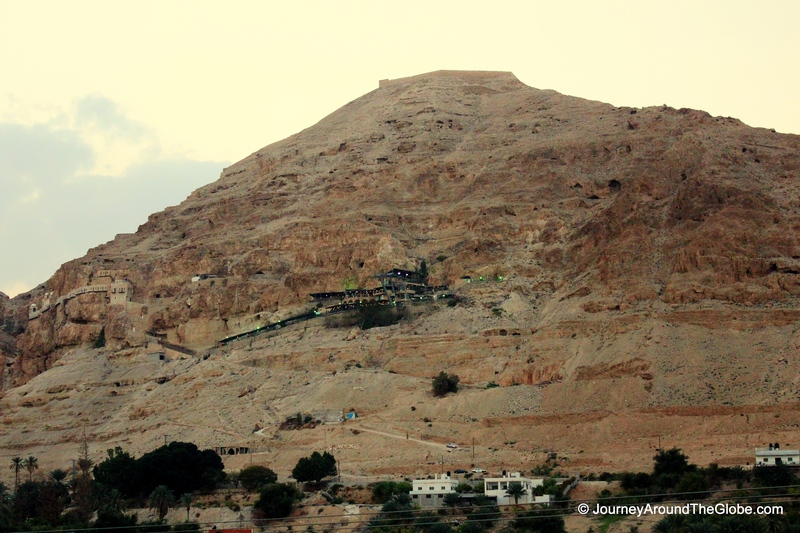 b) MOUNT of TEMPTATION: This is another biblical site and a well-known place for Muslims, Christians, and Jews. Jesus (pbuh) spent 40 days and 40 nights fasting, meditating, and fighting Satan in a cave of this mountain. The cave, which is now a monastery, can be accessed by cable car. Cable car service closes around 5/6 pm; so, we couldn’t go up to the mountain. But the summit of the mount (360 meters above sea level) offers a spectacular 360 degree view of the town along with nearby hills, Dead Sea, and Jordan Valley. c) TOMB of MOSES in NABI MUSA MOSQUE and MAQAM: Tomb of Moses is not really in Jericho, rather about 20-25 minutes’ drive from there. The mosque, on the site of the tomb, was constructed in 1270 A.D. By the time we reached there, it was already very dark and there was no visitor in the mosque. The care-takers were kind enough to open the door for us and let us in for a short visit. The mosque was simple inside but I loved the big inner courtyard which we passed to go to the other side of the mosque to see tomb of Moses. 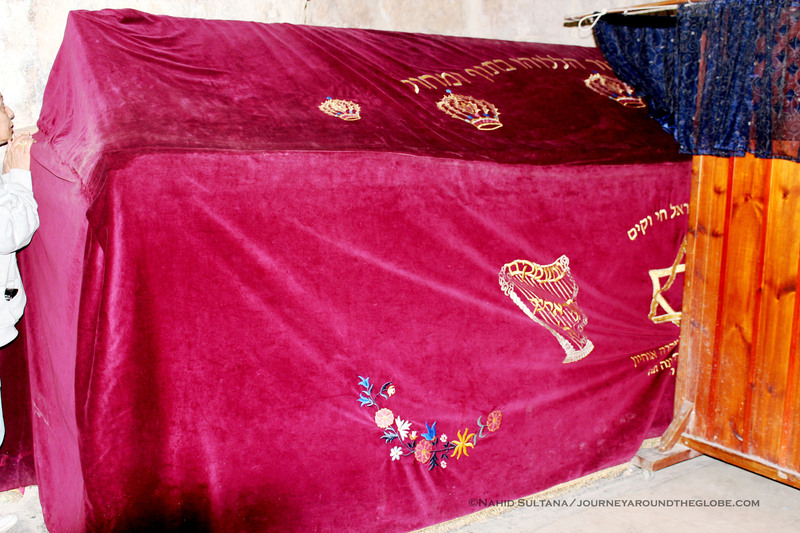 The tomb was covered with beautiful velvet sheet with nice Arabic calligraphy and designs.